I enjoy the rest period between the frantic bursts of Christmas and New Year's Eve. It is a time when we can wind down, reflect, and think about the year ahead. While I am not one for New Year's resolutions, I do know when my body needs to be treated with some respect. Hence it was that after the festive feasting, I ate soup and had a long walk. I didn't take many photos of the soup because I made it after bringing home Sylvia from an outing to see the Paddington movie again and a playdate with a friend (where she had been ill) and while my parents dropped in on the way to the airport to pick up my sister and her son. 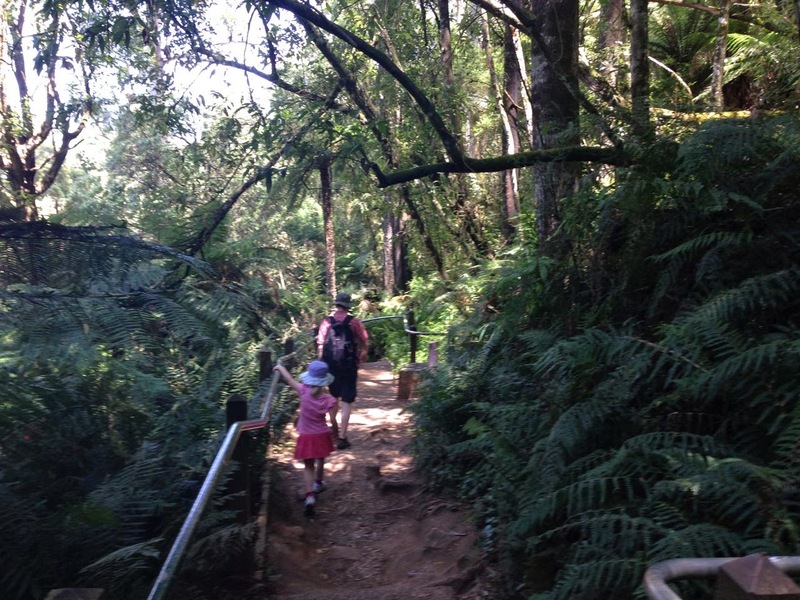 Likewise, I didn't take many photos at the 1000 steps walk we did the day before. 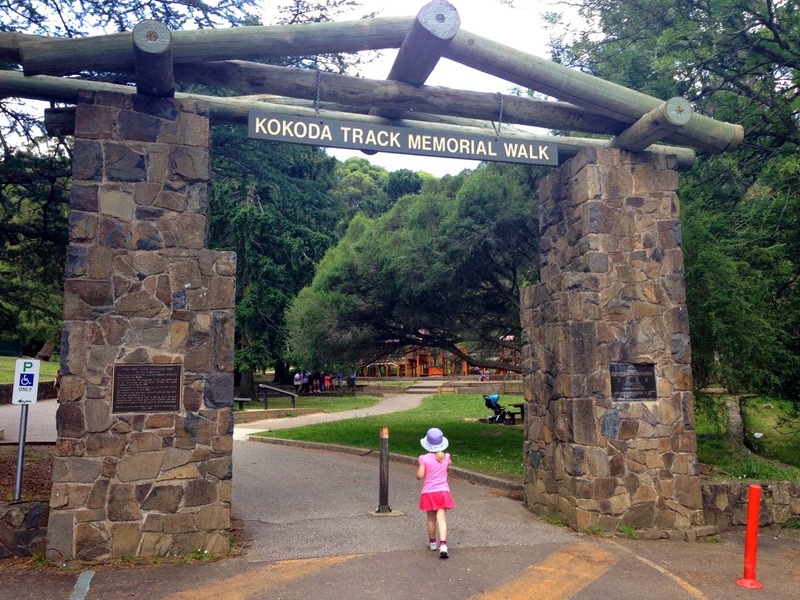 I had decided we needed to get out of town for a bushwalk while E was on holidays. I packed some rolls with cheese and chutney, some fruit and a few last chocolate mince pies. Unfortunately I forgot to pack my camera memory card so I just used my phone for photos. 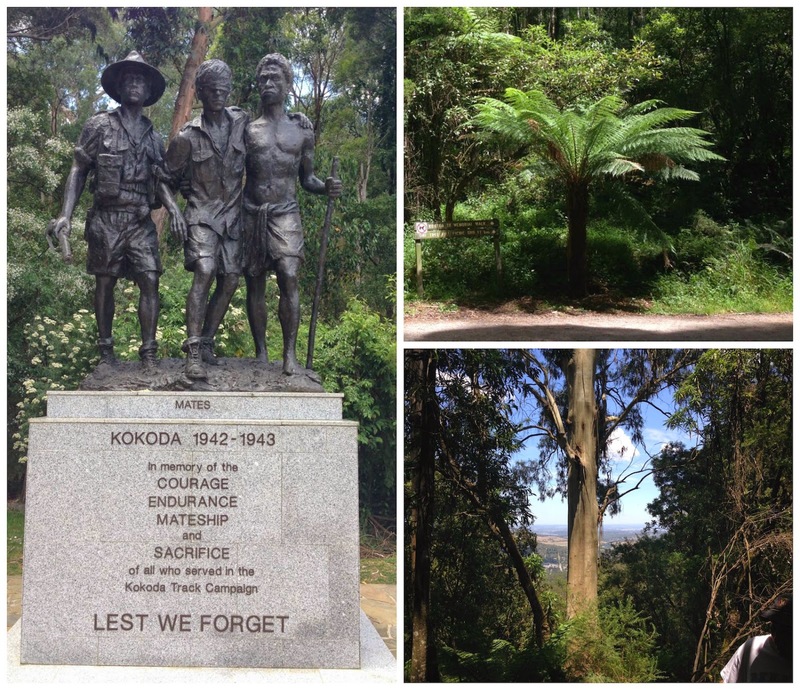 The 1000 steps walk in Ferntree Gully (on the outskirts of Melbourne) is a memorial to the Kokoda Trail in Papua New Guinea where many Australian's showed courage in a battle during World War II. Most of the people walking the memorial trail seemed there for fitness rather than to pay respects. We were there for the scenic walk. The walk was a little more challenging and more spectacular than I had expected. 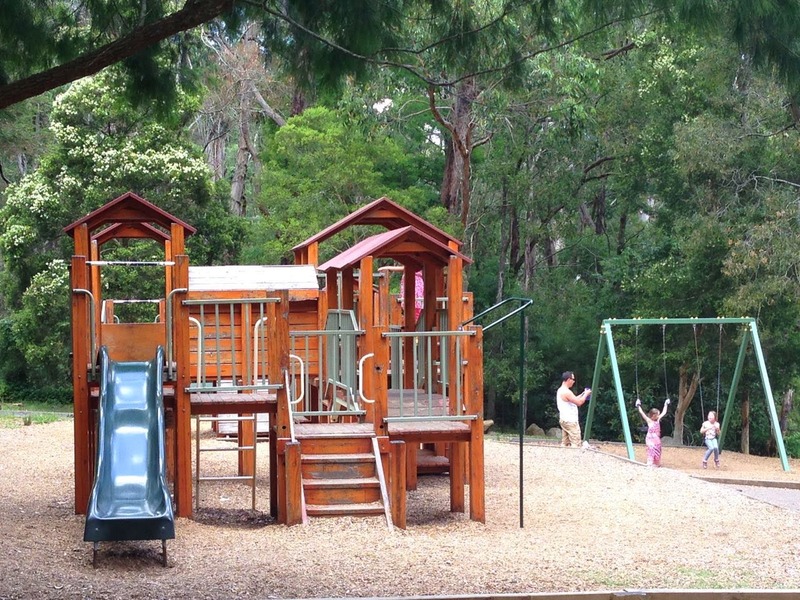 I loved all the rain forest tree ferns and lots of majestic gum trees. The steps had me wishing I was fitter. However we all reached the top and enjoyed eating our rolls. 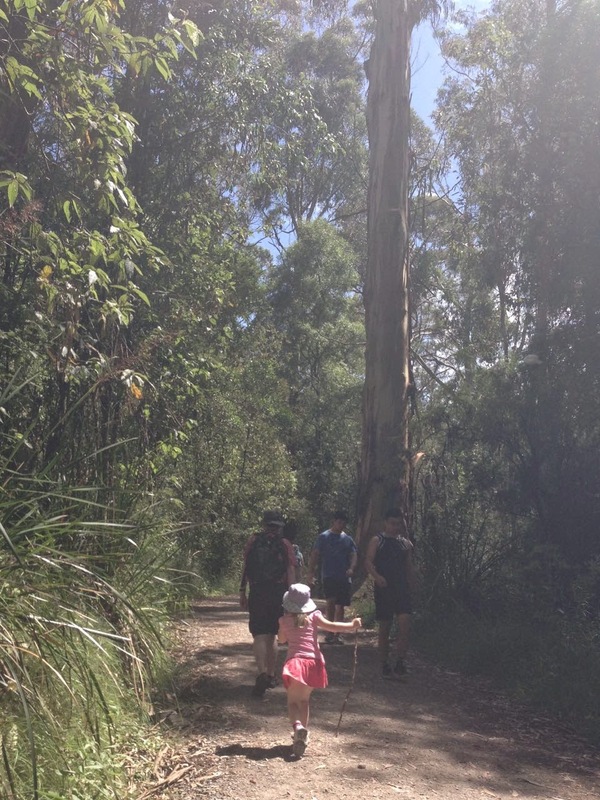 We then headed down with vision of icy poles dancing in our heads. 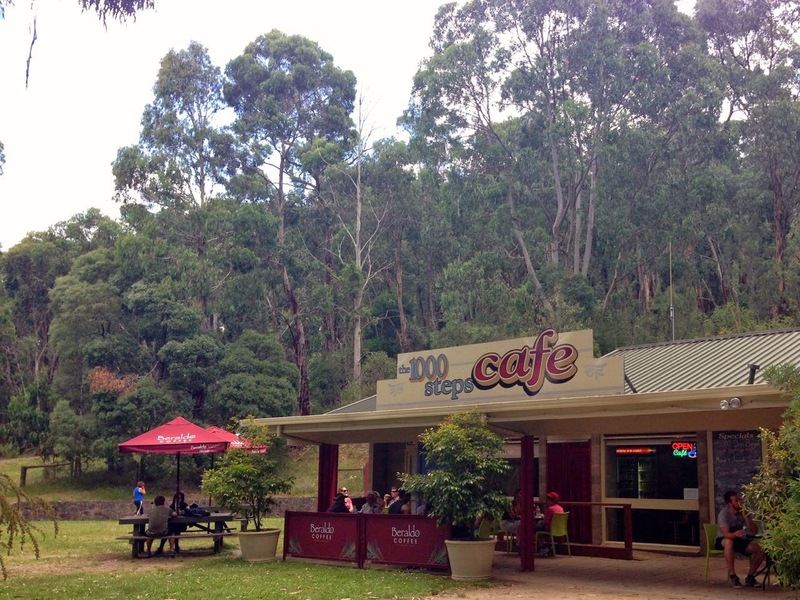 The 1000 steps cafe seemed to offer quite a decent menu with burgers, a "vegetarian sensation", and lots of biscuits. It was warm enough that all we were interested in were the ice creams or icy poles. E and I were ready for a rest but Sylvia was full of energy at the end of the walk and had a lovely time on the playground. I highly recommend this soup (inspired by this recipe) if you want something light after your New Year's indulgences. 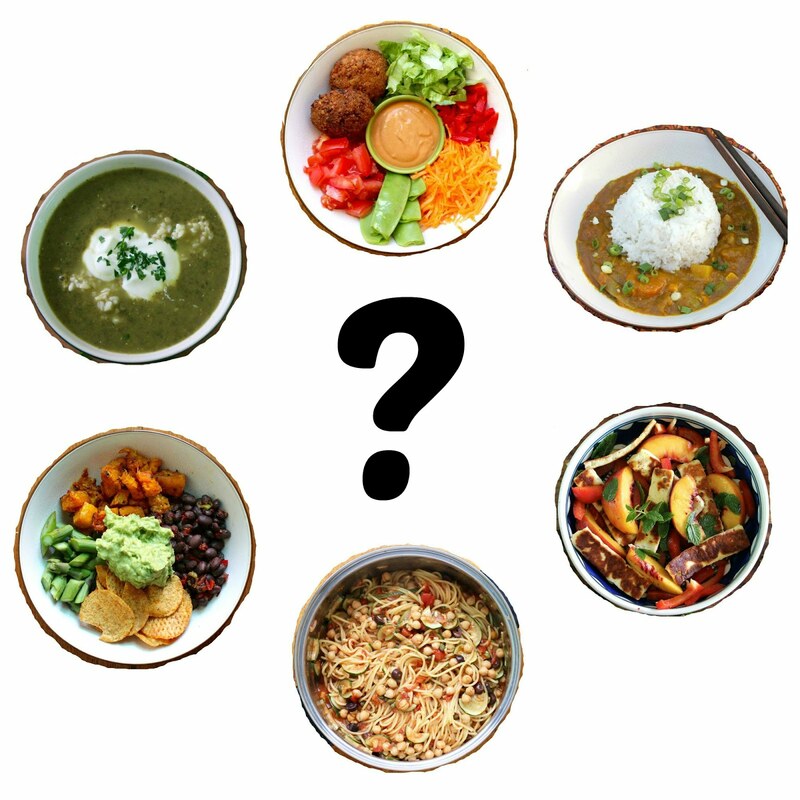 In North America, black eyed peas and greens are often eaten for luck. This dish is not quite that sort of peas and greens but it is as close as I get. Now I am off to make vegetarian haggis nachos for our New Year's Eve dinner. I wish you all fun celebrating the new year (or best wishes for trying to sleep while the fireworks explode around you if that is your preference) and a happy and healthy 2015. I will do a reflection on 2014 post early in the new year. Heat oil in a large saucepan. Fry onion and celery for 5 to 10 minutes until onion is soft. Mix in potatoes and fry for about 5 minutes, then add zucchini and garlic and fry about 10 minutes, stirring frequently. By now the vegies should be quite soft (and the bottom of my saucepan was quite brown). Add in stock, broad beans and peas. Check seasoning and adjust if desired. Simmer for about 10 minutes. Add rocket or spinach. Blend with a hand held blender or as desired. Stir in about 1-2 tablespoons of finely grated parmesan and chopped mint. 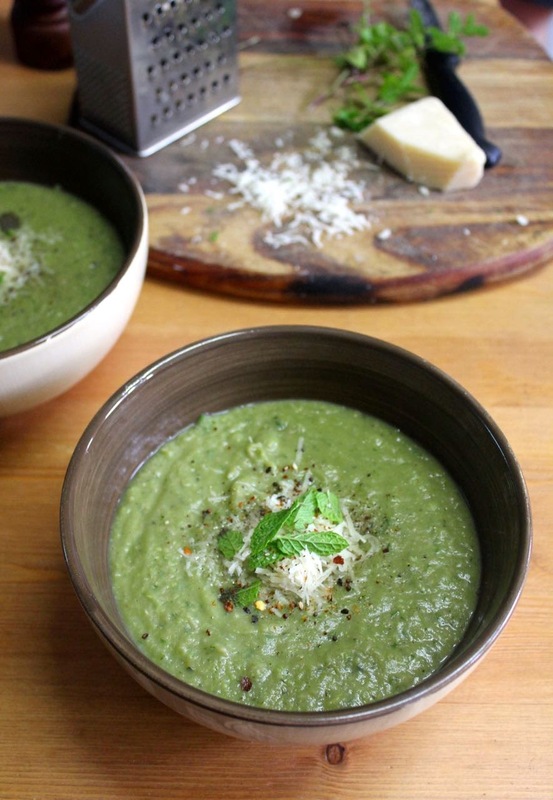 Ladle into bowls and serve with extra parmesan, mint and lots of black pepper. *NOTES: For a vegan soup use some nutritional yeast flakes or a vegan parmesan instead of the parmesan. 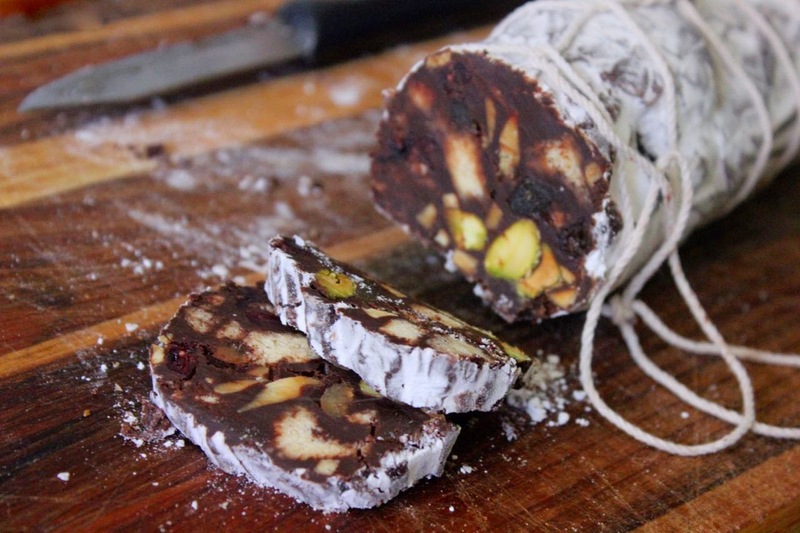 A few days before Christmas I saw two of my favourite bloggers post a recipe for Chocolate Salami on the same day. Hence while shopping at the supermarket, it suddenly seemed a great idea to make it for E as a Christmas present. I looked up the recipe on my phone and added the ingredients to the trolley. It appealed not just because it was full of yummy things, but also because it seemed quite easy to put together. The most challenging moment was when I decided to tie on the string to make it look like a hung salami. It took me a while to work out it was just a matter of looping a knot over the salami for each string loop. Then it was easier but I still had to get the loops lined up neatly. The string work was trickier because I had thought it would be a fun gift to make with Sylvia. She got a bit distracted when it came to rubbing the icing sugar into the chocolate log. It was sticky work with a small child helping out! Explaining to Sylvia that we were making chocolate salami which was to look like meat but did not contain any meat was a little confusing. She asked what salami was. I didn't have any cultural references that she understands. Yet once she understood it was a bit of fun, we shared a giggle at two vegetarians giving a meat-eater a meat-free piece of meat. E was pleased with his gift - once he had ascertained it was not a blunt weapon! He then asked where I had bought it. Ahem, good sir, we made it with our own hands. He was most impressed. However I think I might have eaten more of it than him. I really loved the rich chocolate studded with nuts, cranberries, ginger and shortbread. It is very good with vanilla ice cream. My mum loved it too and suggested some chilli would be good in it. I would prefer orange zest. The original recipe had booze in it but I wanted it to be child friendly. 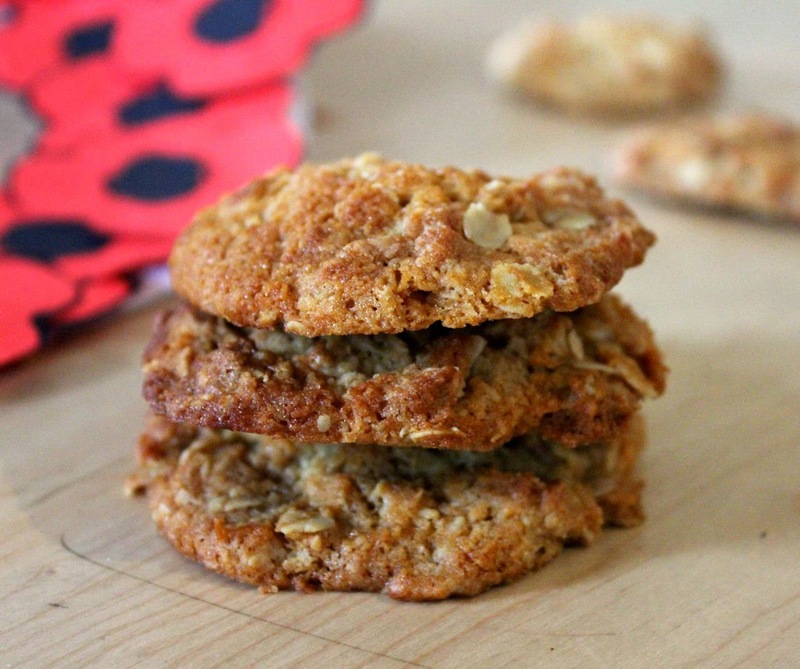 It was so easy and so yummy that I can see this making it onto our list of gifts to make in future. Melt chocolate and butter. 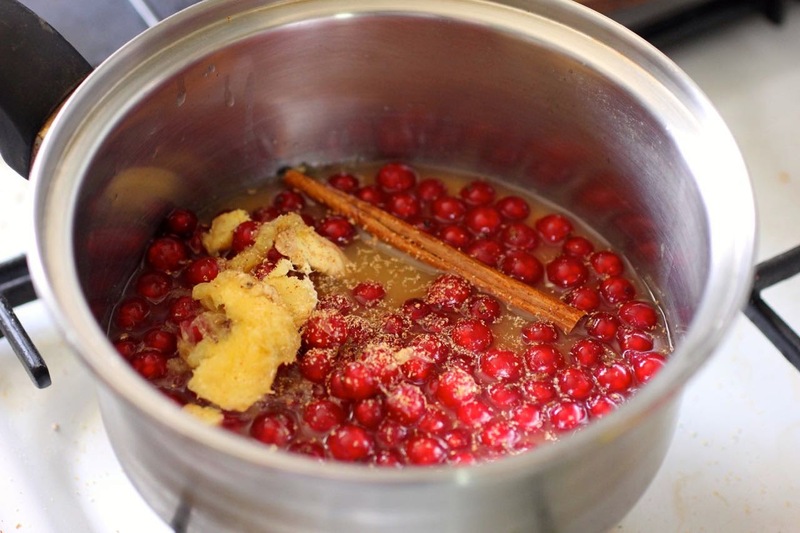 Mix in shortbread, nuts, cranberries and ginger. Cool in the fridge for about 20 to 30 minutes. Lay a large piece of clingfilm on the table and spoon out the cooled mixture in a chunky sausage shape. 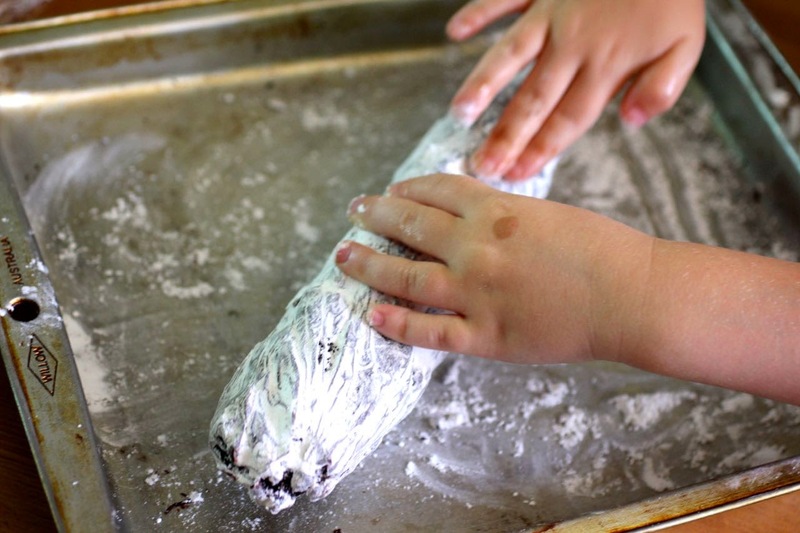 Wrap in clingfilm, twisting the ends, and use your hands to smooth out the sausage through the plastic. Chill in the fridge until hard. We did ours overnight but I took it out once or twice as it was cooling and moulded the shape a little. Wrap and gift to friend or family. We used vegan chocolate and vegan margarine. It would be quite easy to use vegan biscuits or even gluten free biscuits if your recipients has these dietary requirements. 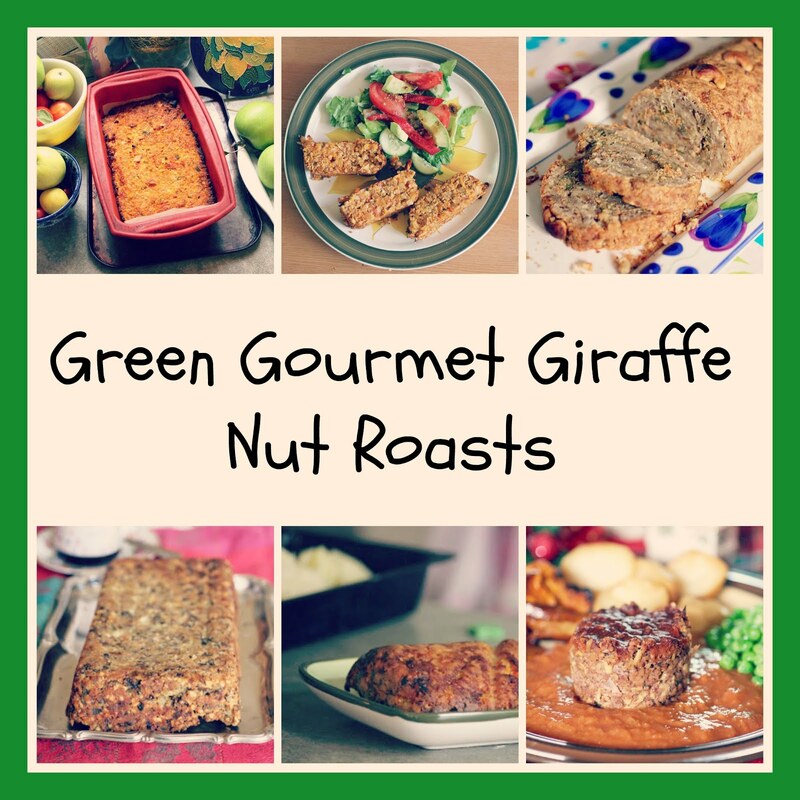 The quantities are quite flexible, depending on taste and how big you want it. I downsized Not Quite Nigella's recipe to make a smaller salami but used more shortbread, after seeing that A Travelling Cook used many more biscuits. 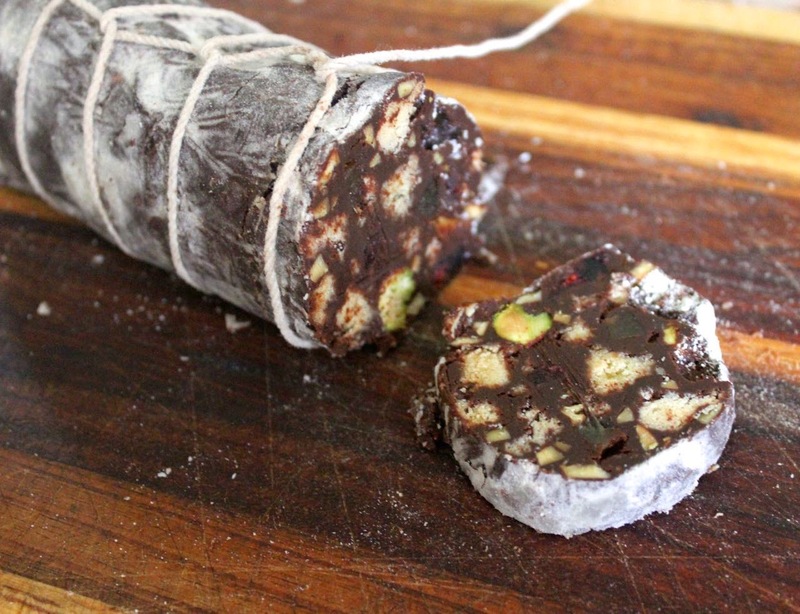 This chocolate salami can be kept in the fridge especially in a hot Australian summer. However I prefer to eat at room temperature and it seems to keep well out of the fridge while the weather is mild. And like that it is over! I hope everyone had a great Christmas and a relaxing break. 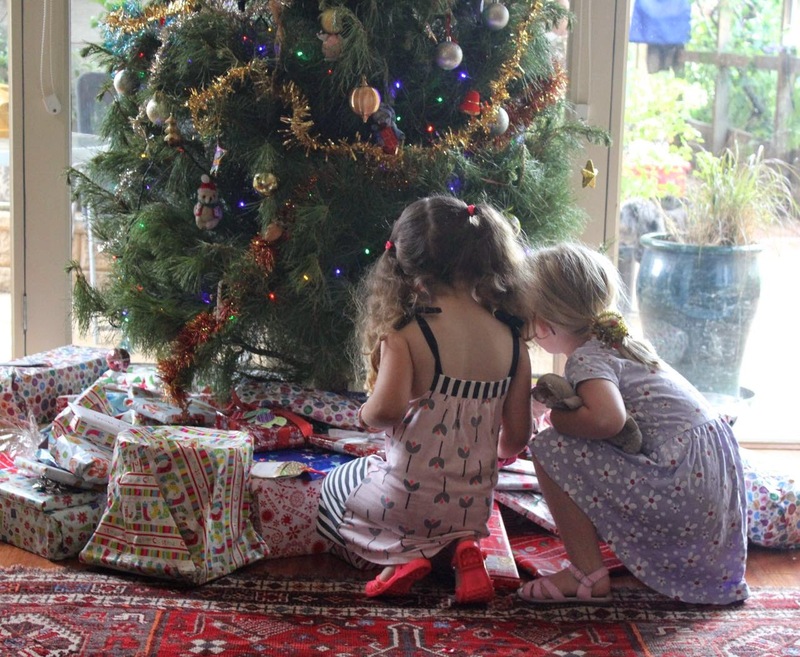 Our Christmas was two days of festive mayhem, family get-togethers and feasting. Sylvia was agog with excitment on Christmas Eve. We let her stay up and see some of the Carols by Candlelight on the telly. She loved it even though they don't do much in the way of traditional songs early in the night. 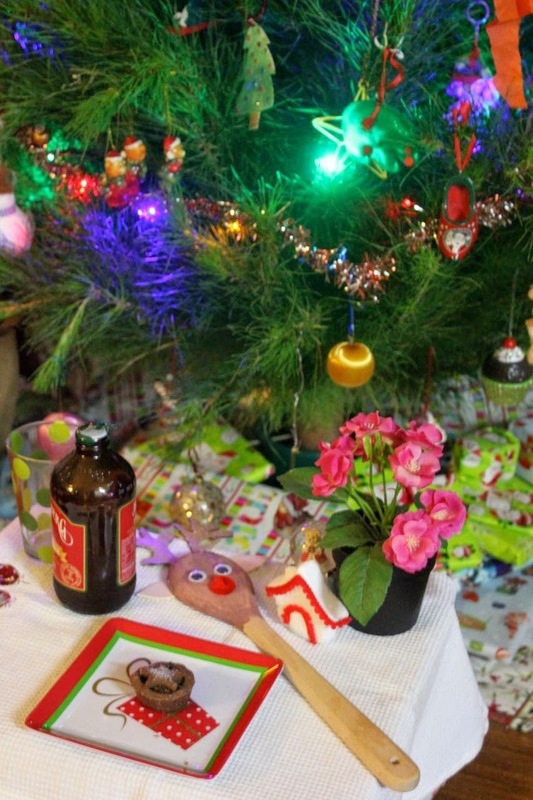 Then with spiced ginger beer and a chocolate mince tart left out for Santa, she dropped quickly to sleep. Meanwhile I was giftwrapping some last minute foodie gifts as I continued to watch the Carols. French lavender salt and some apricot, nectarine and vanilla jam (that I will write about later). Sylvia woke me at some ungodly hour to tell me what Santa had brought her. Fortunately we both went back to sleep. In the morning we opened presents and had cranberry nut rolls with jarlsberg cheese for breakfast before heading down to my parents house in Geelong for more presents and food. My mum had some fancy cucumber boats with hummus and carrot for canapes. My dad and his many helpers handed out presents. Mostly accurately. My brother Dave accidentally opened a present that was meant for my nephew Dash! Oops! 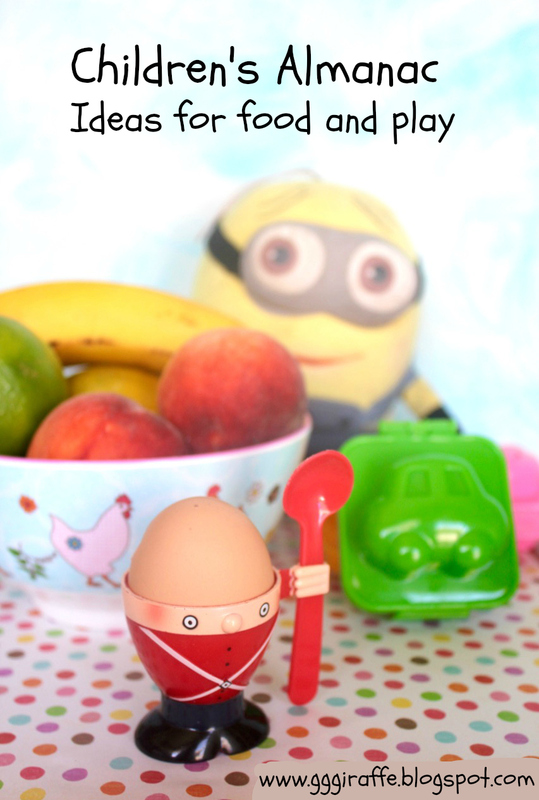 I loved some quirky gift tags. Sylvia got one with chocolate in it and one that was actually made out of a candy cane cookie cutter. Sylvia had been asking for a Frozen doll all December. Yet it was the hairdresser head and the blue ukelele that she really loved. 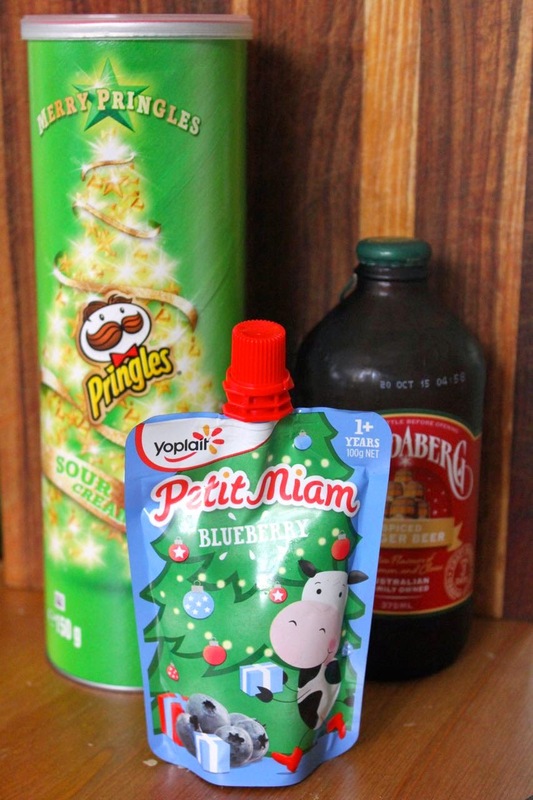 Here is my Christmas dinner. I made nut roast as usual and had lots of vegies. Mum almost forgot the cauliflower cheese. I was glad she didn't! She also made a delicious sangria to drink with dinner. Sylvia managed a mouthful of nut roast. Her preference is for the roast potatoes. But most of all she loves mum's pavolva. When it came to dessert I had to have pudding with custard and some caramel tart. Most of my siblings were off to in-laws after lunch and we relaxed. By evening we were still full and just snacked on some leftovers. One of the difficulties of celebrating Christmas in Australia is trying to enjoy the lights when the sun doesn't set until almost 9pm. 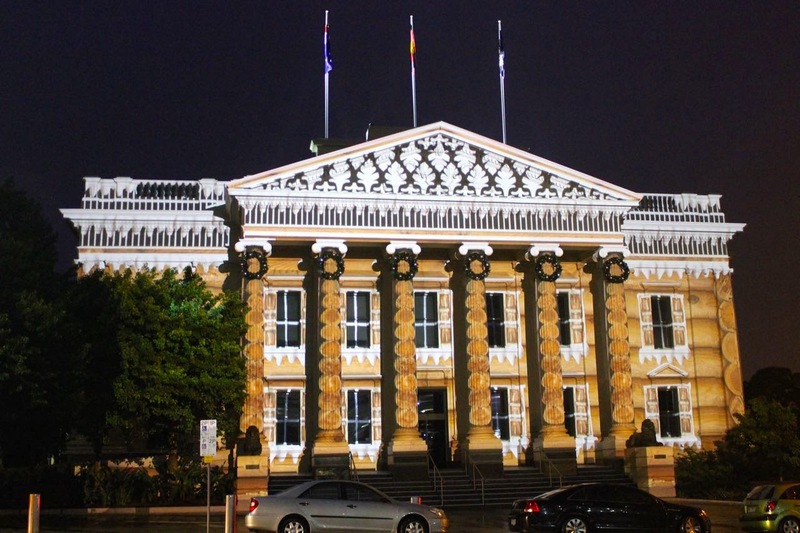 Geelong has pulled all stops out with Christmas lights this year. My dad took us out at about 8.30 to try and see lights before Sylvia was too tired. It was too light. And it was raining. D'oh! 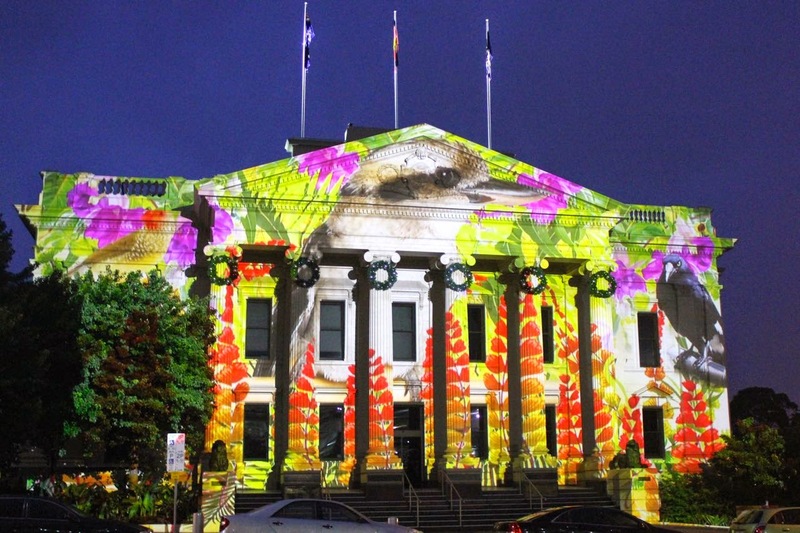 We were determined to see the lights and stood under our umbrellas to watch the light show on the Geelong Town Hall. It is spectacular with kangaroos bouncing, fireplace, candles, art deco, snowflakes, Christmas trees, candy, and a gingerbread house. It went so long it was dark by the time it finished. Sylvia was cold and tired by the end and dropped off quickly when we got home. On Boxing Day my dad's family came over and we had more food and presents. Quiche and salads and roast potatoes. Dessert was more caramel tart, pavlova, mince pies, panforte, stollen, and cheesecake. I was so full I didn't get to try my mum's Christmas fruit cake after dinner. 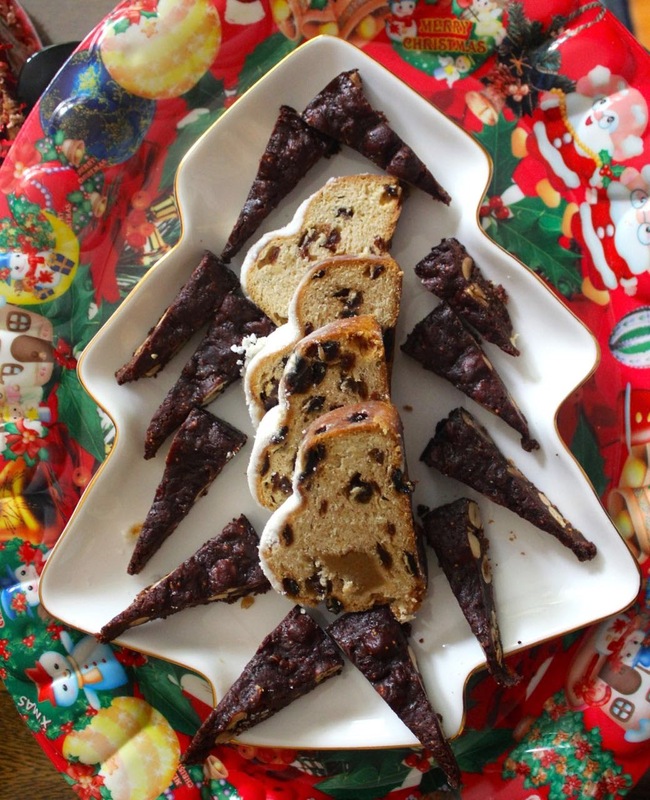 Here is the panforte and stollen. My mum sent us home with lots of leftovers. 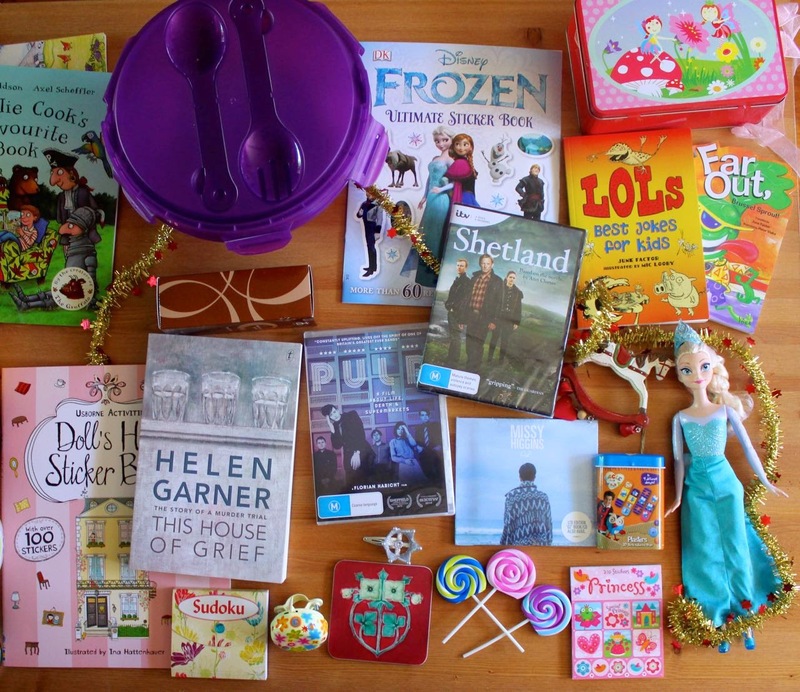 Here are just some of the presents we all received. You can see we were well and truly spoilt. And we have lots of reading and DVDs to enjoy. And I am curious to try Sylvia's new ice cream maker. Today is a quiet day to relax after all the festive craziness. While I write this E and Sylvia are watching Santa versus the Martians and eating Pringles crisps. Yet is is just that sort of day! It is almost Christmas and I am up to my neck in festive baking. I am looking over my to do list at what has not been done. 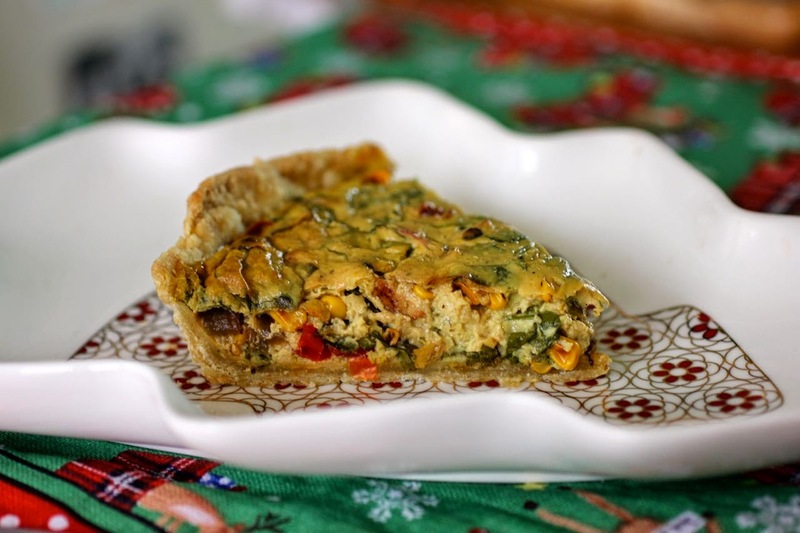 I had planned to share a work in progress vegan quiche but that will have to wait until after Christmas. 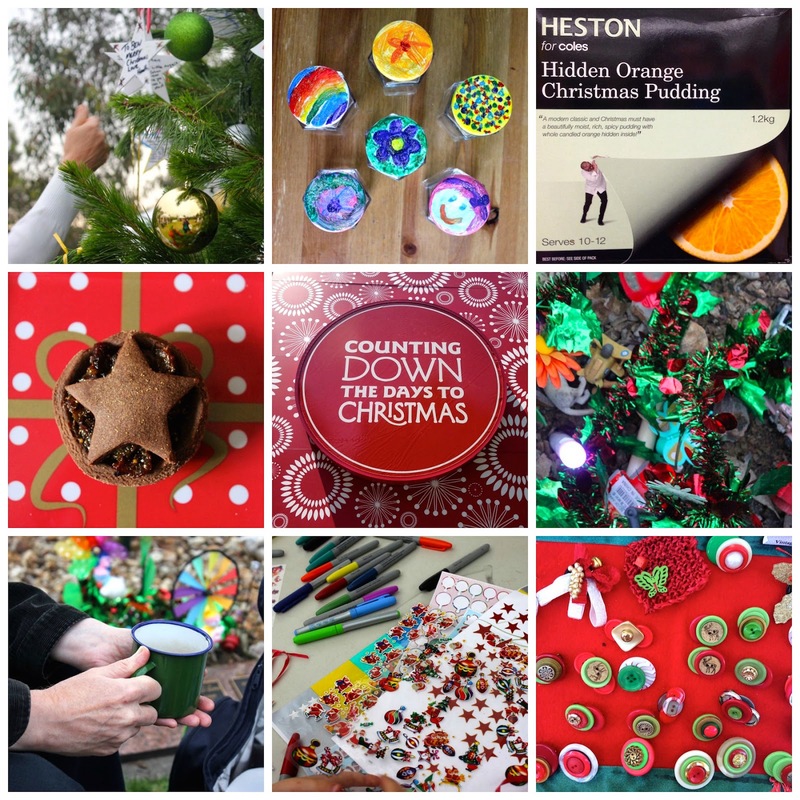 Meanwhile here are a few photos of festive fun! This is the vegan quiche I made last night with tofu and besan. More about it soon. It wasn't perfect but I enjoyed it. We did the last of my Christmas grocery shopping today. Then E ate some of the chocolate I bought for the panforte. So I sent him out for more. I've had enough of the shops. 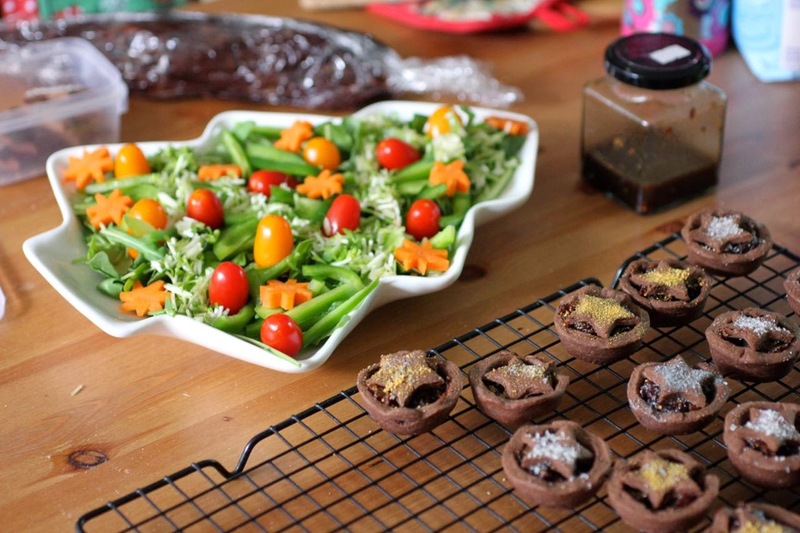 Today I made panforte with a candy thermometer, vegan chocolate mince pies, Christmas tree salad and some other gifts that I will talk about after Christmas. (Not that the intended are likely to read this but you never know!) I also took a batch of mince pies to a Christmas party on the weekend. They disappeared fast. I was excited to finish all my fruit mince during Christmas for the first time since I started making it. Usually it lingers in the fridge for months. 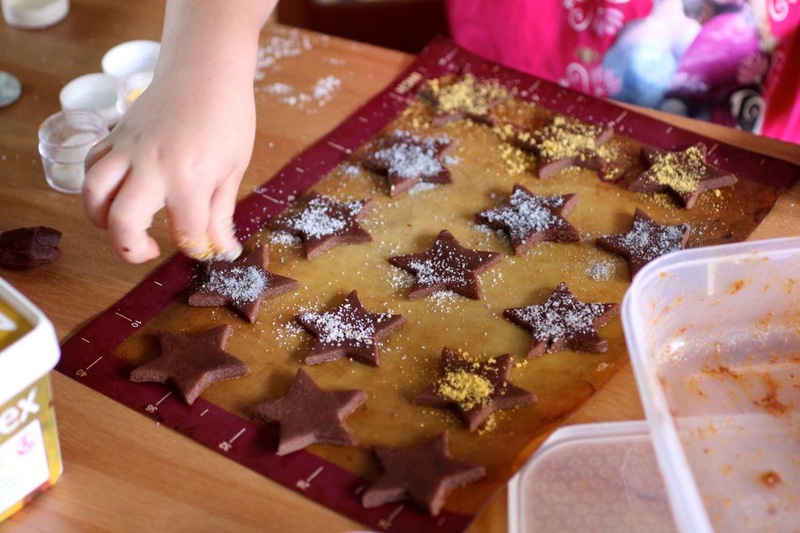 We made star biscuits with the last of the chocolate pastry. Sylvia enjoyed sprinkling glitter on them and sharing them with her friend at dinner tonight (after pizza and Christmas tree salad). I made red currant and orange punch for Christmas drinks with our neighbour on the weekend. It was lovely and refreshing with ginger ale. 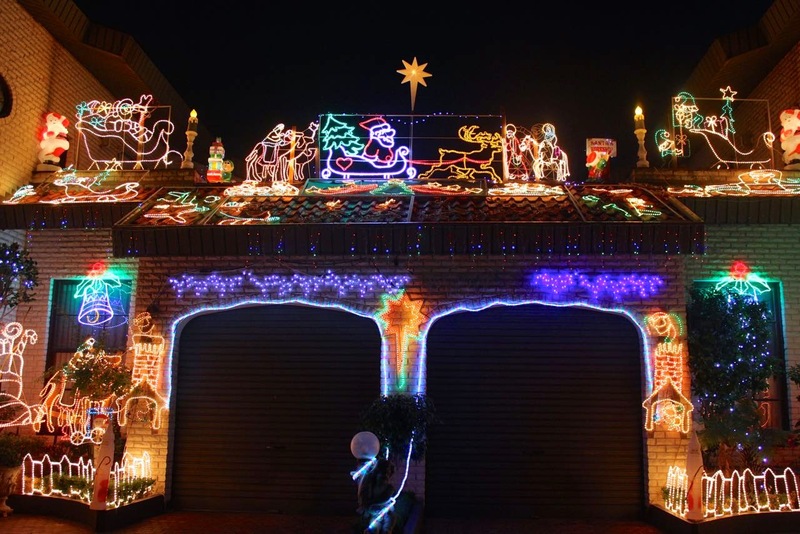 Last night we drove around the neighbourhood to look at Christmas lights. 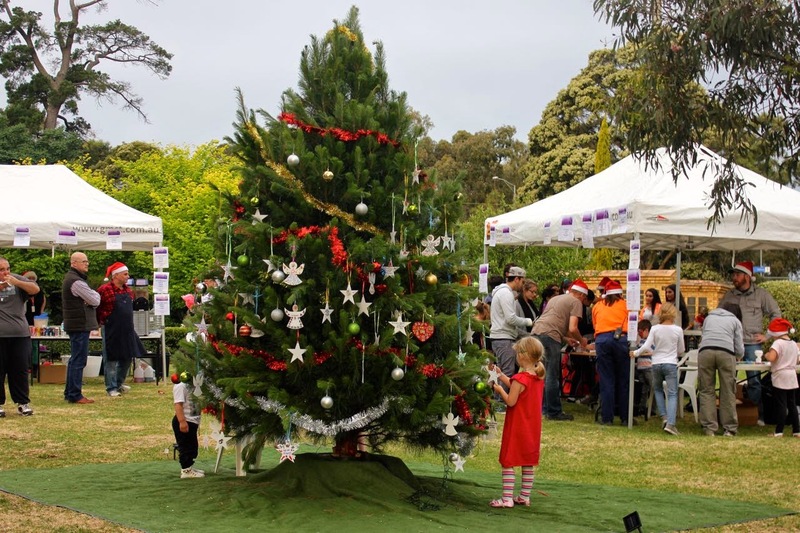 These one in The Grove in Coburg were impressive. And no doubt we enjoyed them more than the later ones when it started to rain! Yesterday Sylvia and I met one of her child care friends at Hay's Paddock in Kew. 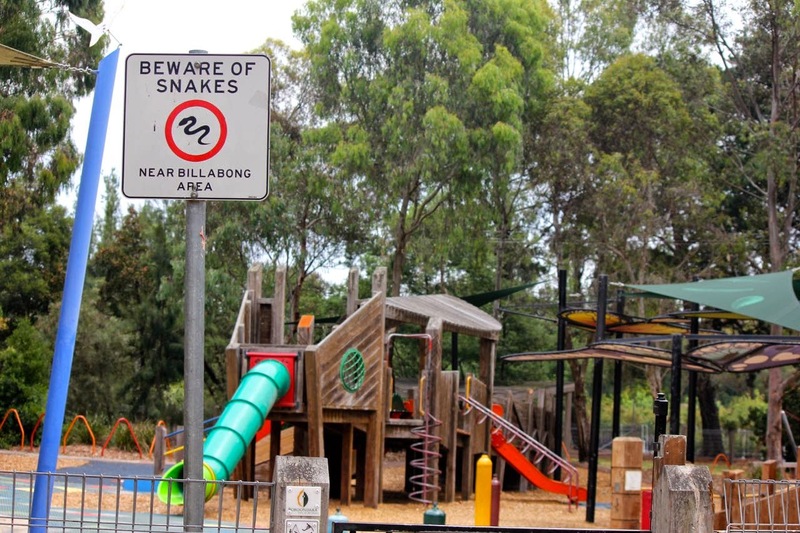 A great playground but I am glad we didn't meet any snakes by the billabong. 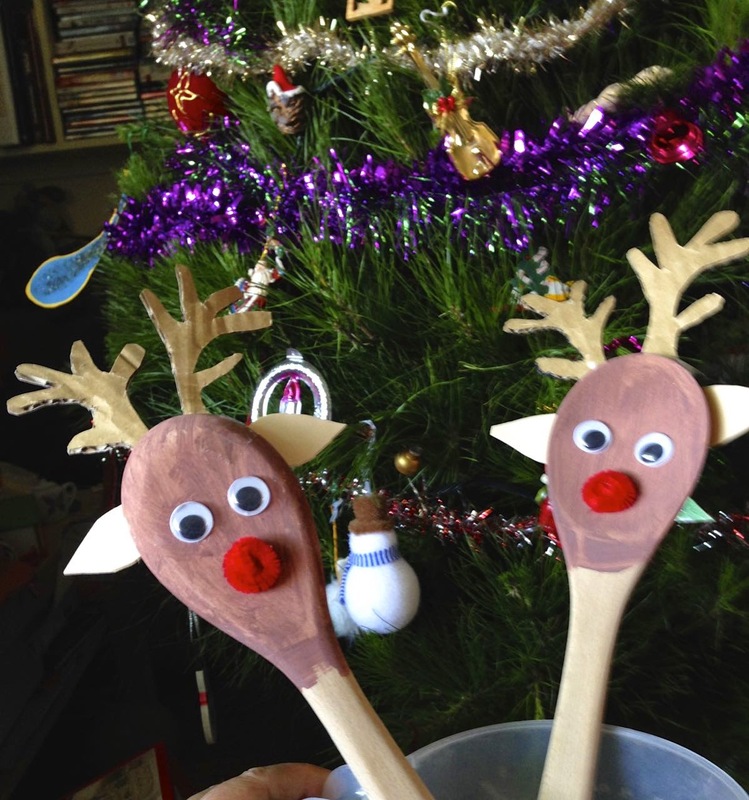 Lastly here are two wooden spoon reindeer Sylvia made with a schoolfriend. 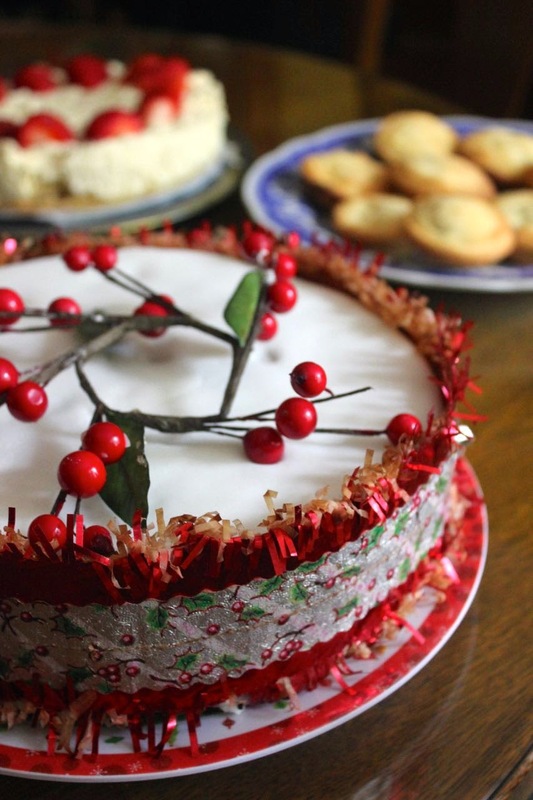 There is much to do tomorrow, so I wish you a happy Christmas full of good food, good company and good cheer. 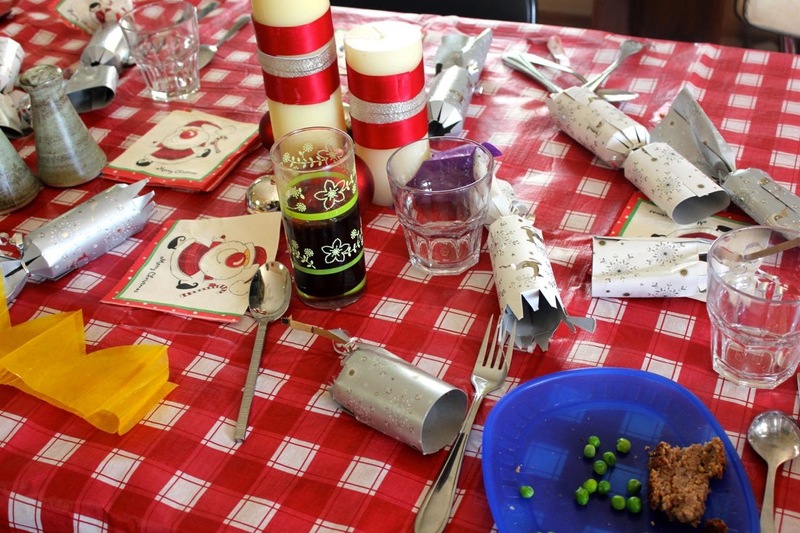 I will be back after enjoying my Christmas nut roast with mum's roast vegies and some plum pudding with my family. Summer calls for salads. Something easy that requires lots of greens, something juicy, a sharp vinaigrette and creamy cheese is perfect. Caeli's Strawberry Balsamic Salad with Cashew Cheese has been on my mind ever since she posted it. Finally I made it, albeit with tomatoes and beetroot instead of strawberries. 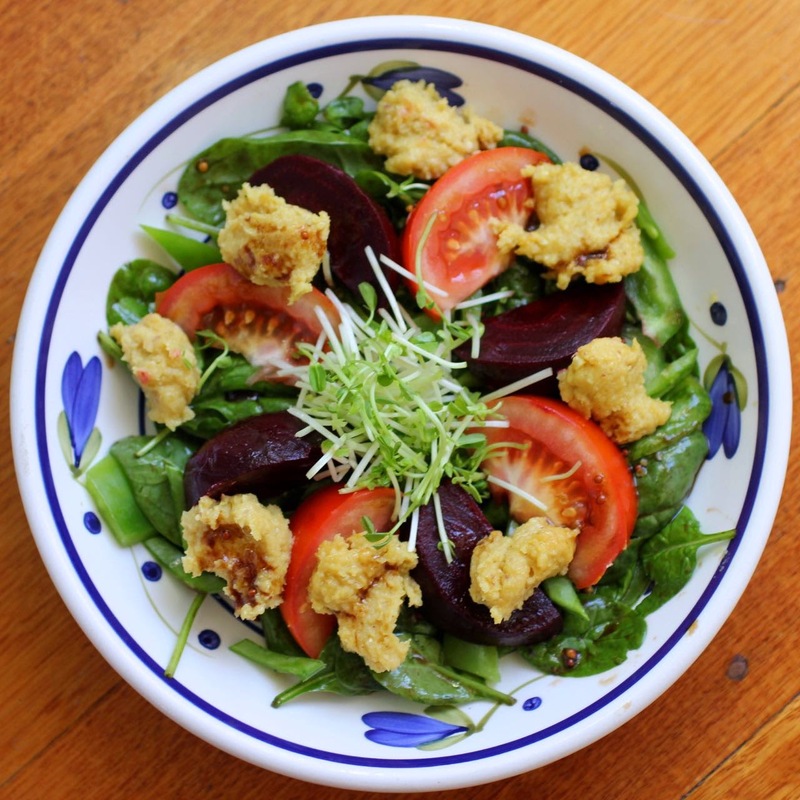 It is the sort of salad that will welcome what is in the fridge and excite your taste buds. I'd highly recommend this dish for Christmas either as a side dish or even a light meal after all the feasting. We had a little of the cheese leftover and loved it with crackers. Sylvia wasn't keen on the cheese but she dipped her vegies in the vinaigrette and yelled out that I should make it every day. That makes it child friendly in our house! 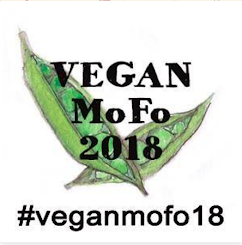 I am sending the avocado hummus to Healthy Vegan Fridays #27 hosted by Kimmy of Rock My Vegan Socks and Robin of Vegan Dollhouse. Make the cashew cheese by blending all ingredients. Lightly whisk dressing ingredients (or shake in a sealed jar). Toss the spinach with about half the dressing. Divide spinach between two bowls. Arrange remaining salad ingredients in the two bowls. Spoon dollops of cheese over the salad. 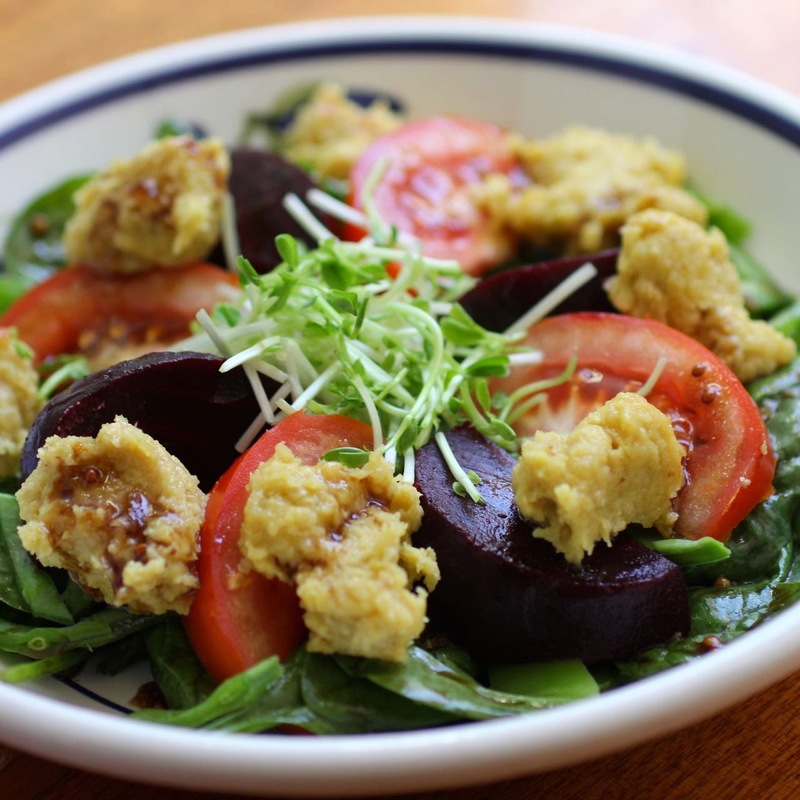 Drizzle with remaining vinaigrette. NOTES: I only soaked the cashews for about an hour because I used a high speed blender. I did take note of Caeli's advice not to make the cheese too smooth for the salad and left a little texture in it. I found I had a little cheese and dressing leftover but they were gone before the end of the night. Can it really be only a week until Christmas day! Inconceivable! I feel I have done enough festive baking for the season already. For a start, I've already made three batches of mince pies. But if there is another week, I reckon I might squeeze in another batch before the big day. 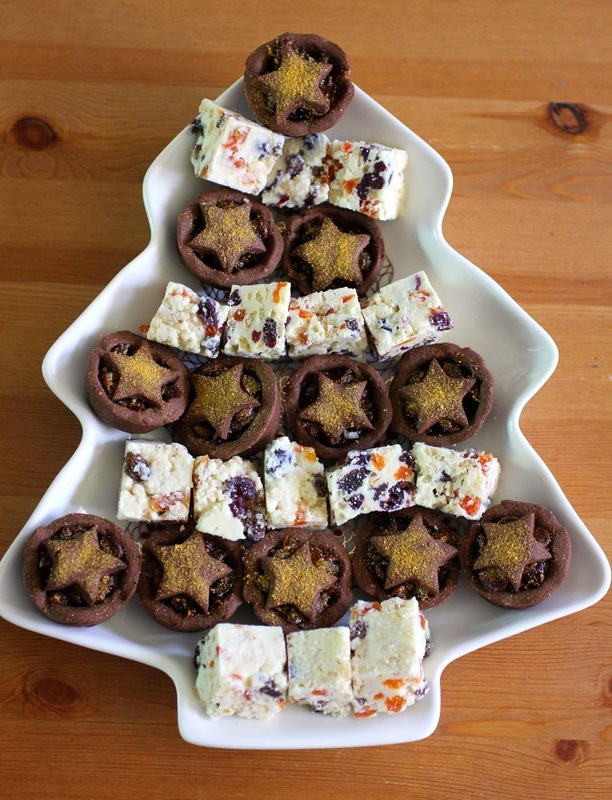 I have been enjoying experimenting with baking mince tarts and other Christmas foods. I am not fond of making pastry. It is fiddly and either too thick or too thin, too crusty or too soft. And I really hate pastry recipes that call for an egg yolk. I don't know what to do with an egg white. It is not as though I make pavlova or meringues. 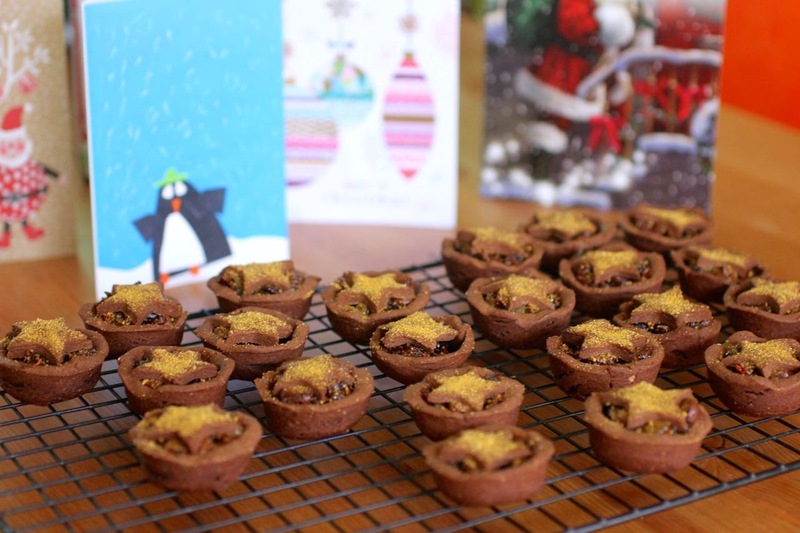 Last year I made chocolate pastry for mince tarts that had an egg yolk. 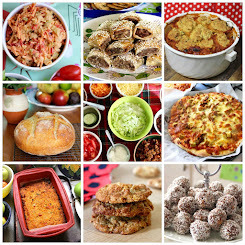 So this year, I decided to look for a vegan recipe to avoid the egg conundrum. Having made this pastry three times I am quite happy with it. The first time I baked it a bit long and it was too crisp. Making three batches of mince pies has helped me hone the recipe so that I am really happy with it. The reason that I have made three batches of mince tarts is that they are great for entertaining and picnics. 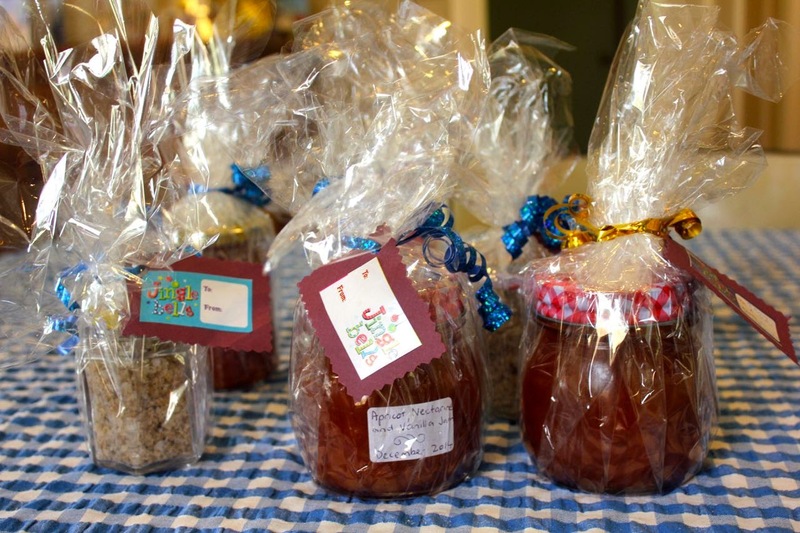 I made a batch for a carols service a couple of weeks ago. Then I made a batch earlier this week to take to a Christmas party. And yesterday I made some when Sylvia's school friend and family came for dinner. 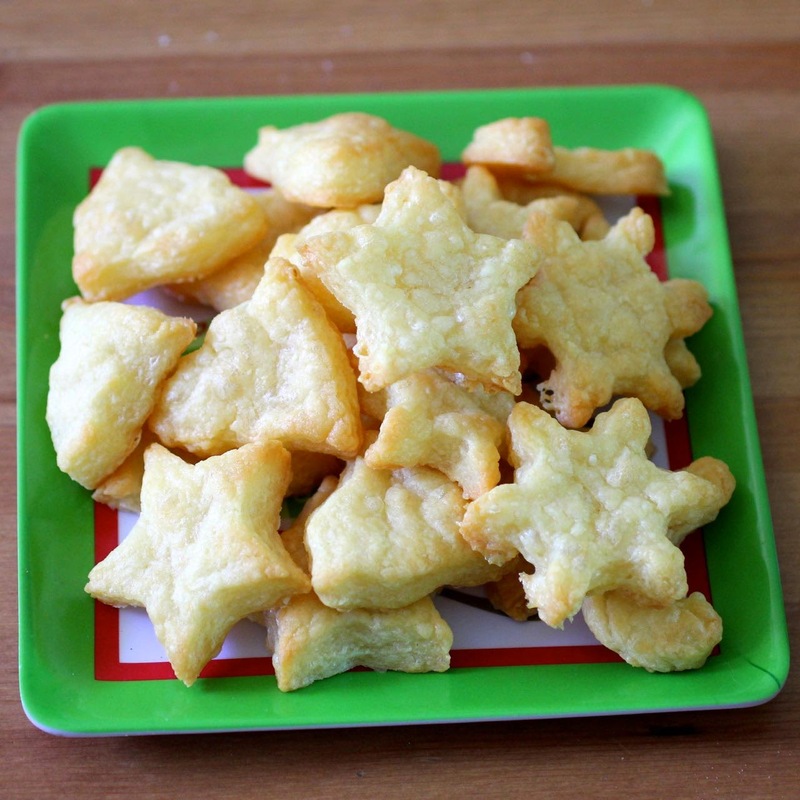 I also took some cheese biscuits along to the Christmas party. They are from Nigella's How to Eat (a bit like these.) I made them to make sure Sylvia had something to eat other than crackers and sweet food. She did rather enjoy them. Though my favourite comment about the chocolate mince pies was when she took a bite of one and a friend laughed and said Sylvia had closed her eyes because they were so good. Everyone enjoyed the mince pies at the party. 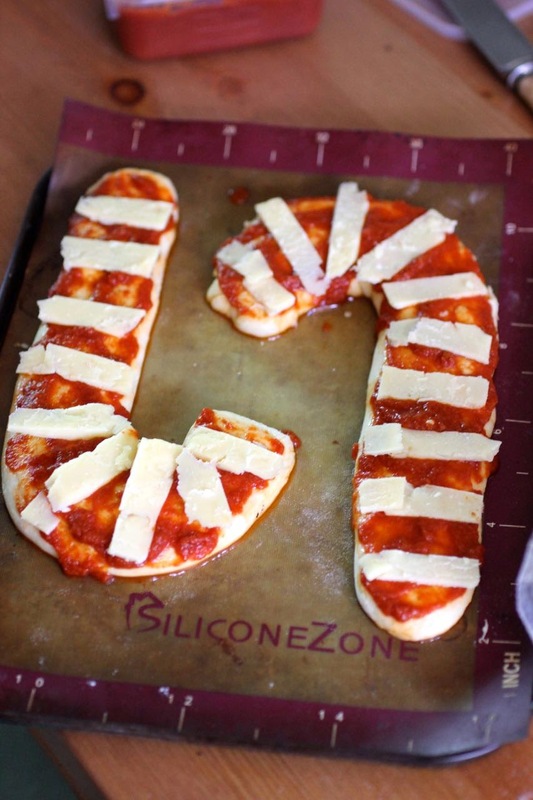 When Sylvia's schoolfriend came over, I decided to try a candy cane pizza. I rolled the sourdough pizza dough into a long sausage, then flattened and shaped it on silicone sheets. I spread them with tomato sauce and then place strips of cheese long them. They looked really good when they went into the oven. I baked them at 200 C for about 20 minutes. When they came out of the oven, they were less impressive. I must try them again. (And there is still time before Christmas). Next time I think I would either just spread cheese on the pizza and then arrange stripes of red capsicum or alternate stripes of tomato sauce and cheese. As our guests were ready to go yesterday I remembered I had dessert. Oops! They stayed a little longer to sample the mince pies and some White Christmas. I had made the White Christmas for a school end of year party yesterday and had brought home some leftovers. Quite a few actually. I wonder if today's children don't know about White Christmas. I also think I might try it with half the coconut as I noticed some other online recipes do. 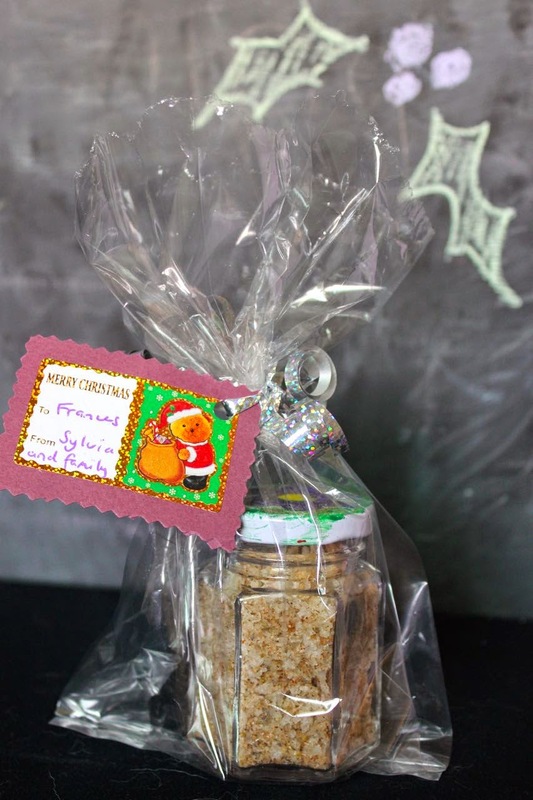 I made French Lavender Salt to give to Sylvia's teachers. I didn't like the colour of the lids on the jars so Sylvia and I painted them. I felt that I did a good job with the gift wrapping. If you are like me and don't have great wrapping skills, you could check out 21 Festive Gift Wrapping Ideas by Jac (of Tinned Tomatoes) or these cute sparkly gift tags by Claire K Creations. On the weekend, we had planned to go to another carols service but we were too tired. However I still made pate and rice krispie slice. I planned to make pale blue slice and cut it as snowflakes. Something went wrong with some of the food dye and it turned out green. We used an Ikea set of cutters to make a 3D Christmas tree. 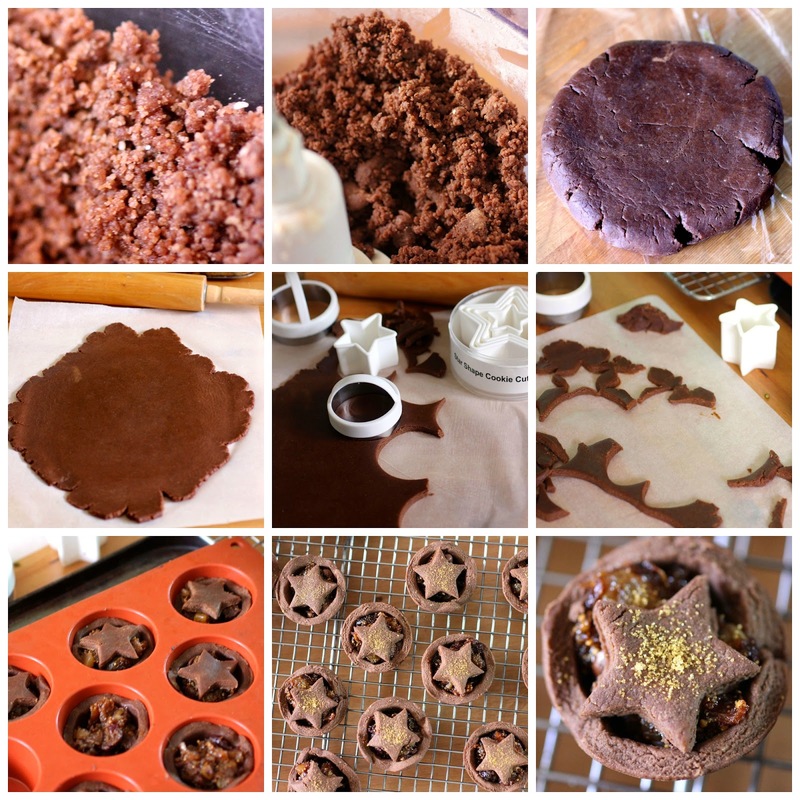 The first one I did was too warm and melted (like the Wicked Witch in the Wizard of Oz) while we put little icing star decorations on it. I put the slice in the freezer before my second attempt at the tree and just drizzled it with white chocolate and sprinkled some gold sugar sparkles. It lasted long enough for a photo! 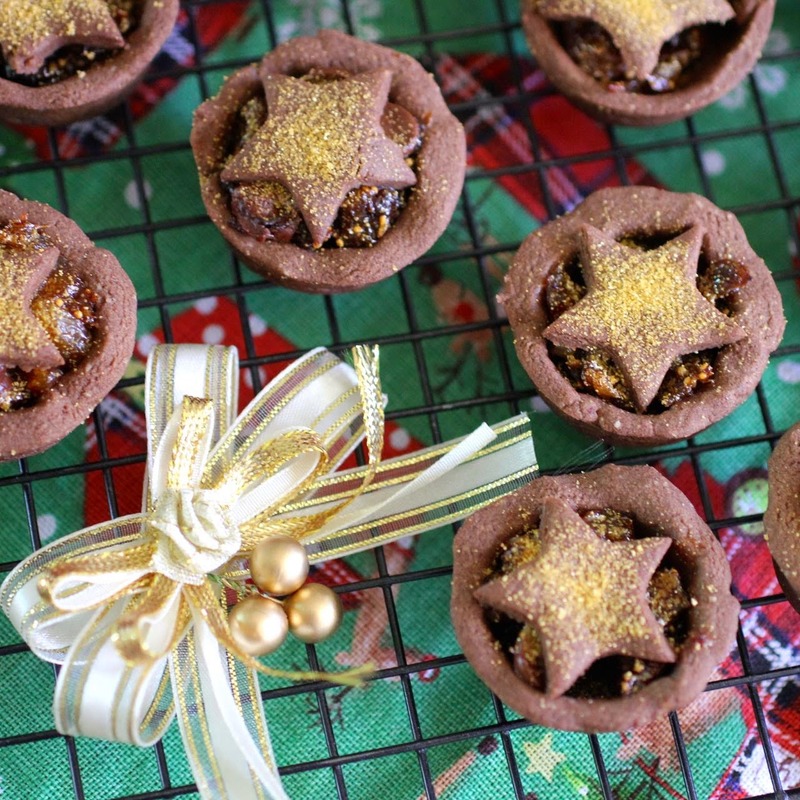 The chocolate mince pies use my home made fruit mince which is full of figs so I am sending them to Choclette for We Should Cocoa because figs are the theme this month. I am also sending them to Karen of Lavender and Lovage for Tea Time Treats (co-hosted by Jane of the Hedgecombers) for the theme of glitter, sprinkles, candles and shiny stuff. It was this even that inspired me to sprinkle the gold dust on the mince tarts which I love! 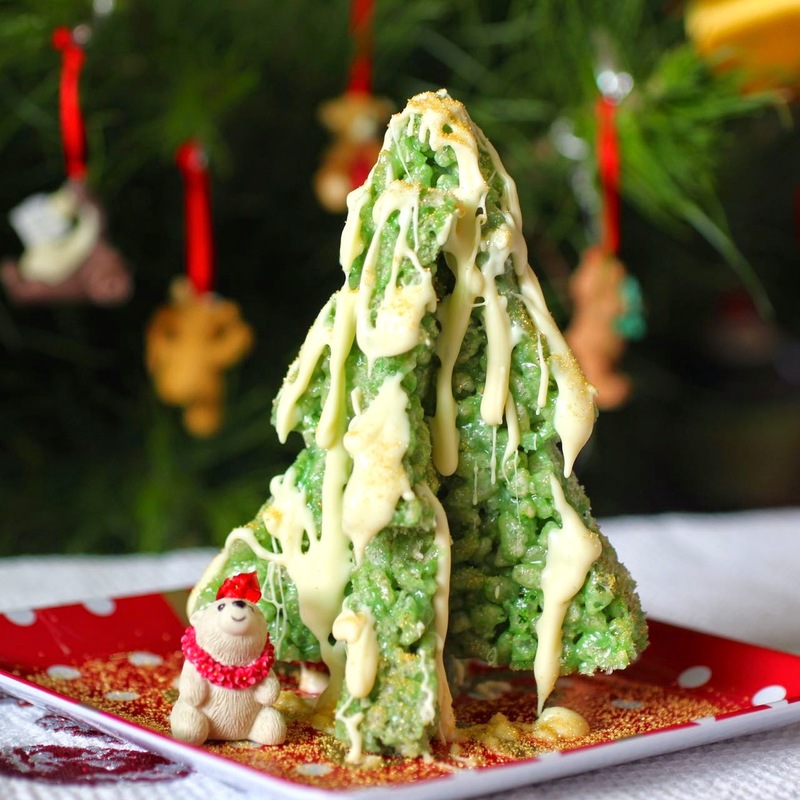 And I am sending the last photo of the rice krispie Christmas tree to Jac for No Croutons Required. 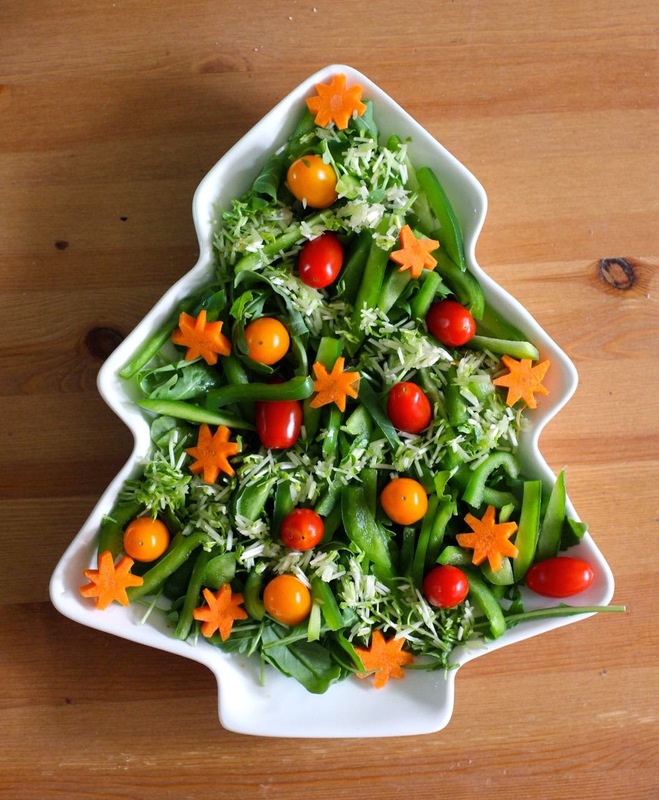 This is a vegetarian soup and salad blog event but each December Jac and Lisa have a Festive Photos theme which is always lots of fun to check out. Mix dry ingredients in food processor. Add in margarine and process until mixed in. Add 1 tbsp of water and process again. Pinch mixture between your fingers and if it sticks it is done. If it is still a bit crumbly add another tablespoon of water. (I found it did not go into a ball in the food processor and it needed only 1 tbsp water.) Tip mixture out of food processor (you wont need a floured surface). Press together into a smooth ball with your hands. 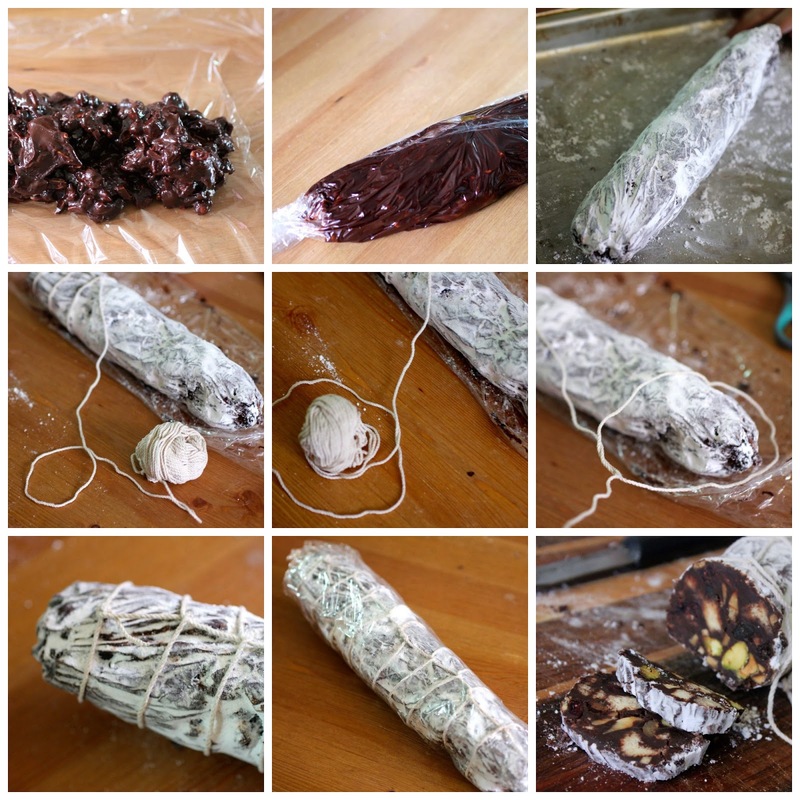 Wrap in clingwrap and refridgerate for at least 20 minutes. Preheat oven to 190 C. Lightly grease 2 x 12 hole mini muffin tins. Mix together fruit mince and chocolate. Roll out pastry on baking paper until it is about 3mm thick. (I would start with two thirds of the pastry and wrap the remainder and return to the fridge.) Cut circles slightly bigger than your mini muffin holes. (I use a scone cutter but even a glass would do.) Carefully place circle on mini muffin hole and use your fingers to gently push it in and against the edges to form a little cup. 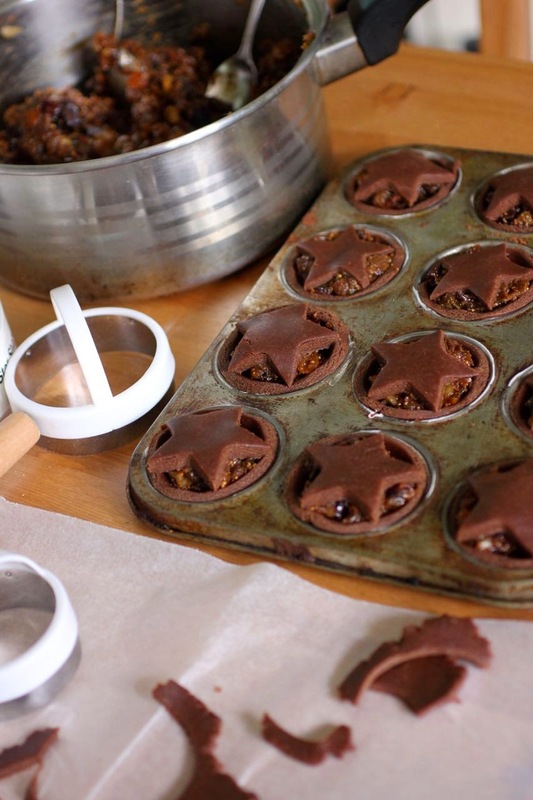 Drop spoonfuls of fruit mince mixture into each cup to fill it to the top. 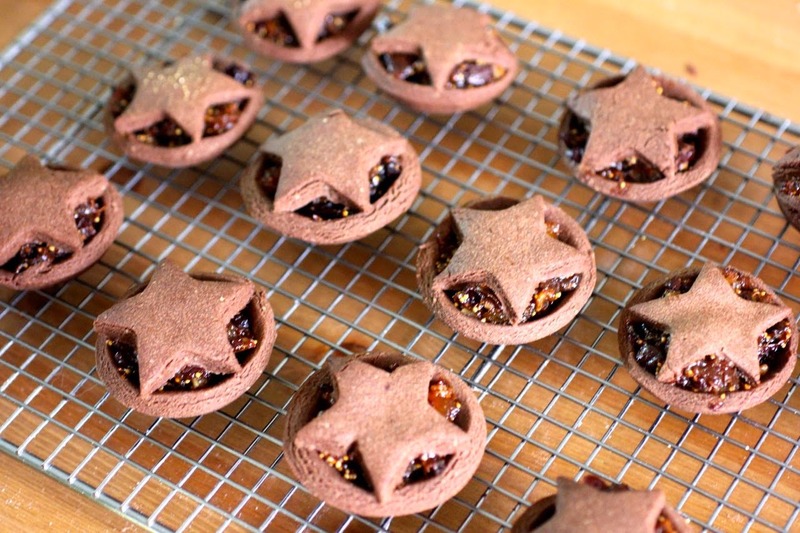 Cut out little stars (or circles if you prefer) and place on top of the fruit mince. 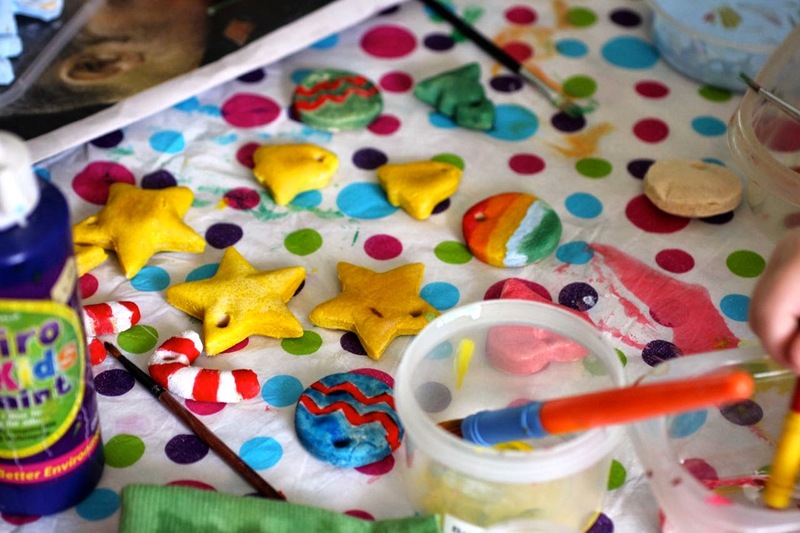 Sprinkle with glittery sugar. 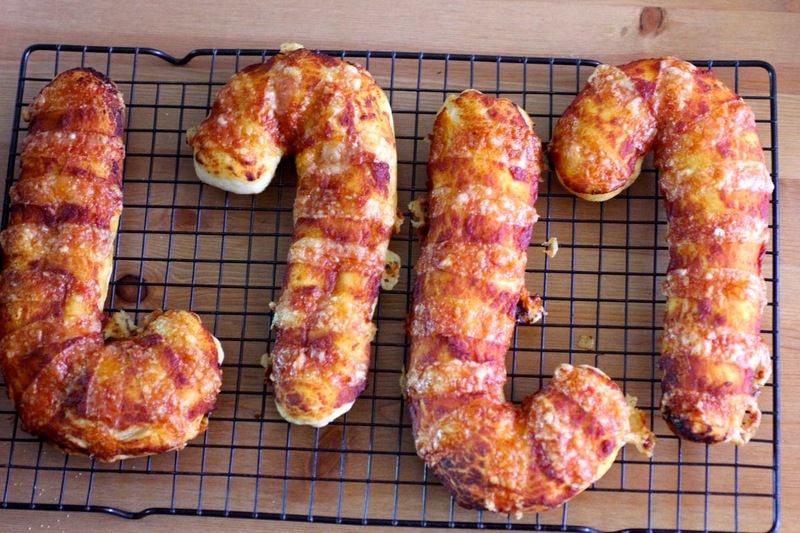 Bake for 10 to 15 minutes. (15 minutes for me.) When they are baked, leave in the tin for about 5 minutes and then carefully pop out onto wire rack. Cool and then store in an airtight container. 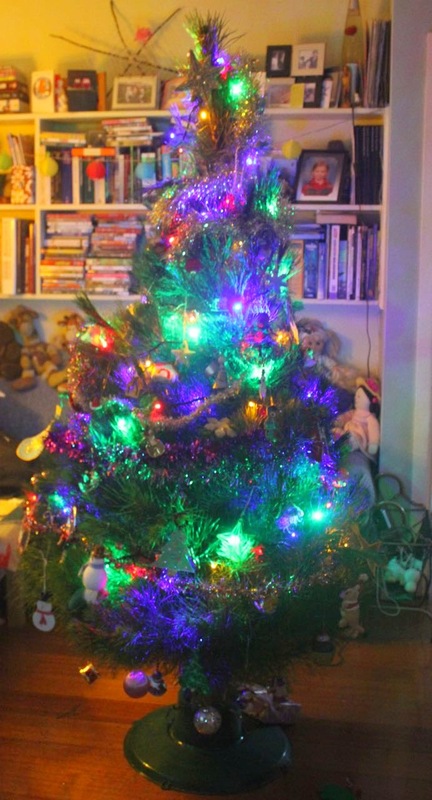 'Tis the season for twinkling Christmas tree lights, for shiny excited eyes of children, for pleasing others with great creative gifts and baking. 'Tis the season for looking for that extra ounce of energy to make it all happen. 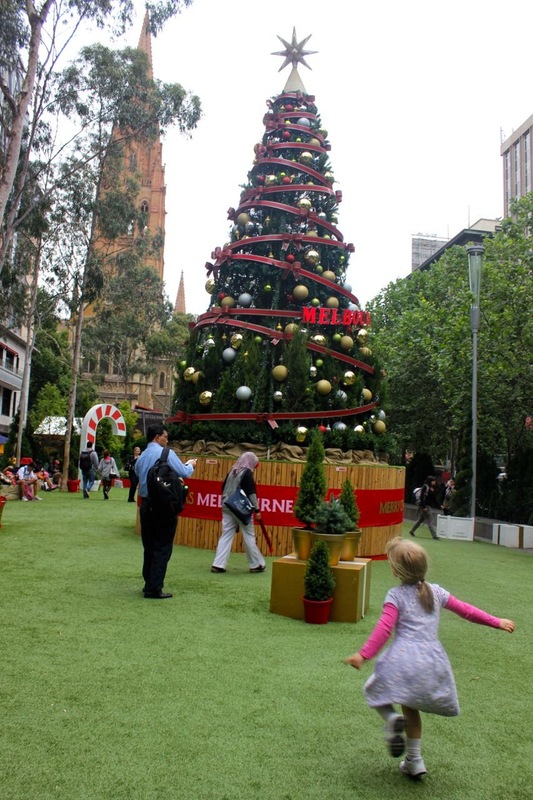 Let's take a walk through some of the Christmas goings-on around Melbourne. I am fascinated by the Christmas merchandising in the supermarkets. Gingerbread house kits seem all the rage. 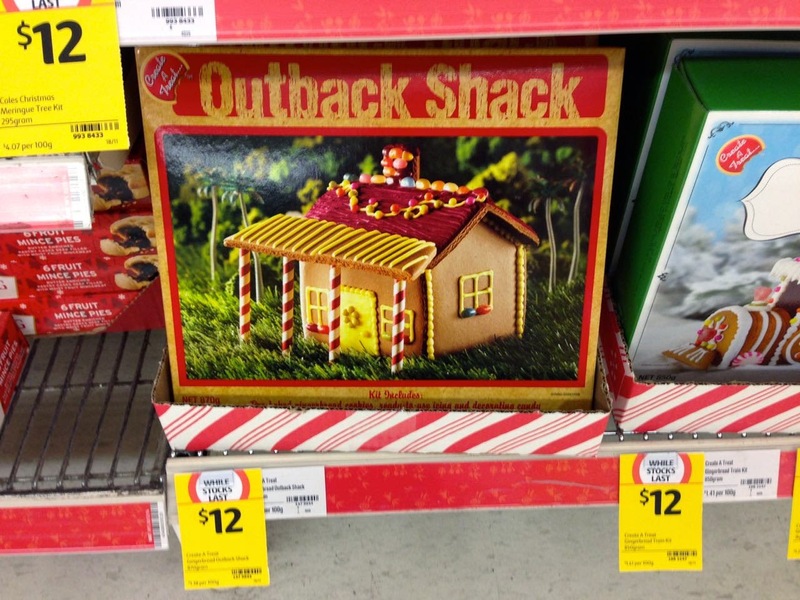 I really liking the novelty of making an Outback Shack gingerbread house. I was also surprised to see the Heston Blumethal's Christmas puddings range in Coles. The hidden orange doesn't enthuse me. I am more tempted by his puddings with caramel filling and chocolate filling. 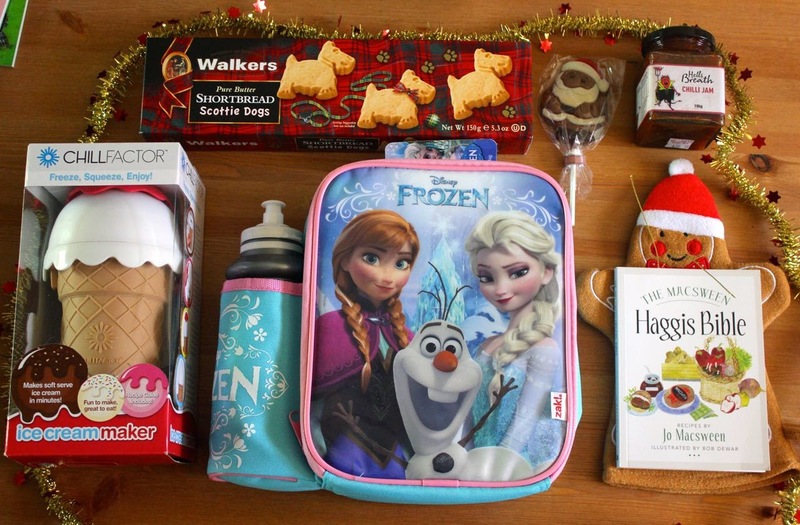 And all these Christmas goodies have been on the shelves so long that now they are being sold at cut prices! 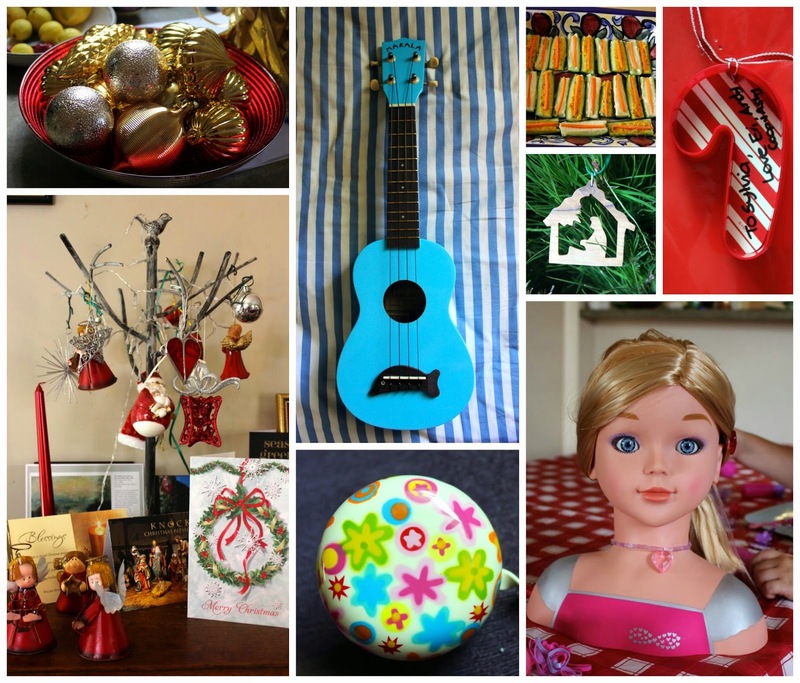 That is Christmas craziness! 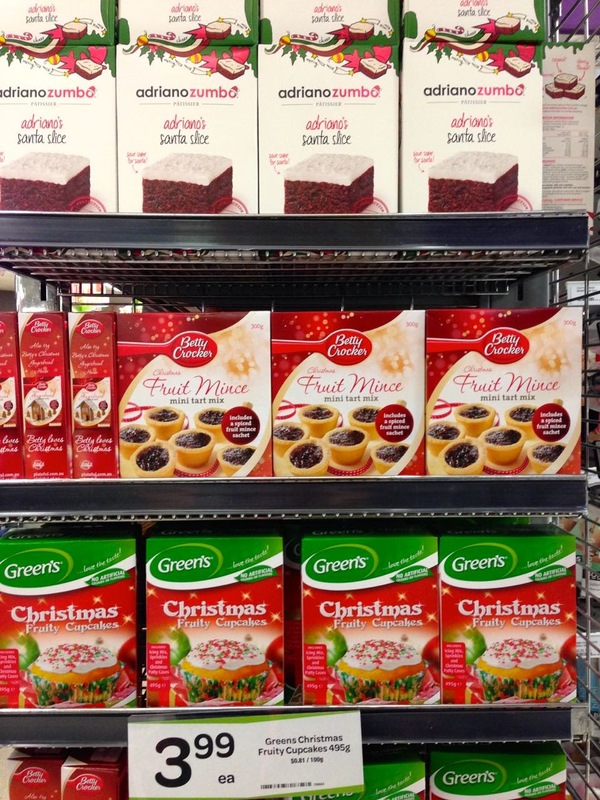 Woolworths has lots of Christmas baking package mixes that are just gimmicks. Take for instance the Betty Crocker's Fruit Mince Mini Tarts. What more does it offer than a packet of shortcrust pastry and a jar of fruit mince? Or the Green Christmas Cupcakes which seem just like regular cupcakes with some christmas sprinkles. We planned to go to two carols services this year. Christmas got the better of us and one carols service was all we could manage. 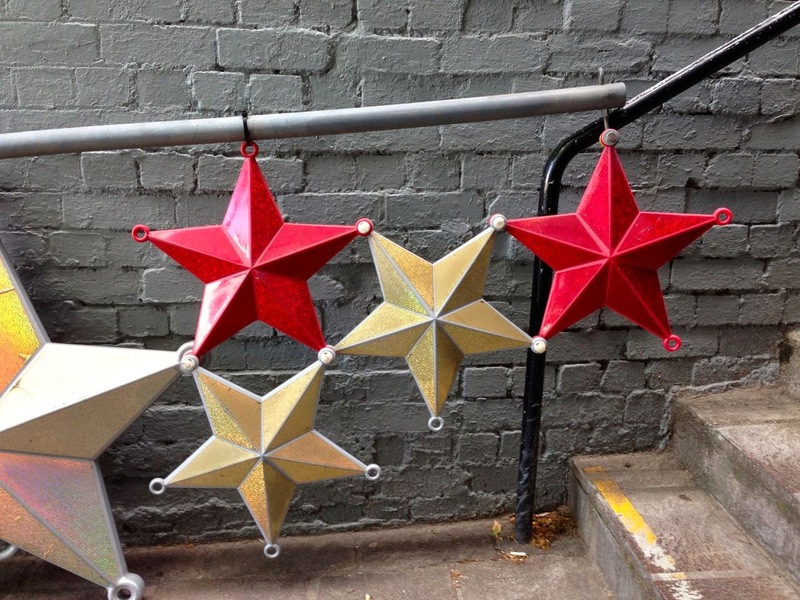 Sylvia decorated two stars for the outdoor Christmas tree and queued to see Santa. 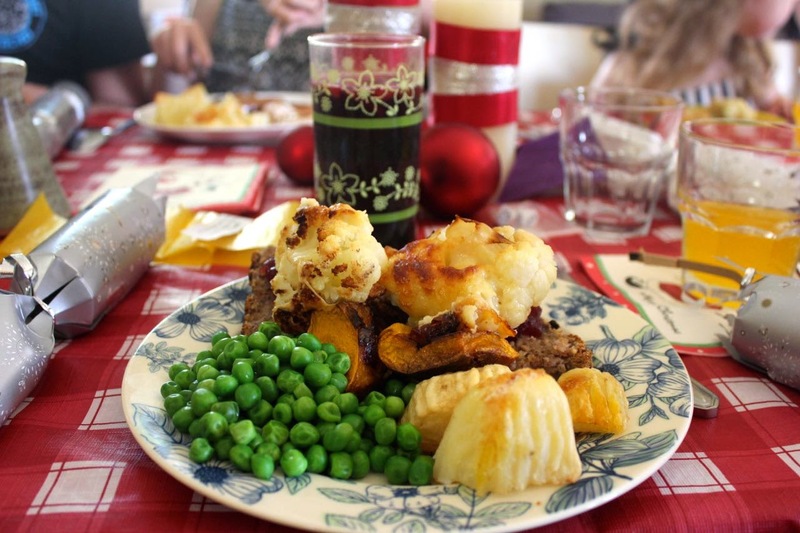 When planning to go into the city, we despaired of finding any Christmas meals. It isn't like in Edinburgh where every pub has festive dishes on the menu at this time of year and I am always able to find a vegetarian meal. We had dinner at Lord of the Fries. Just chips and a mini burger. Then we saw that Krispy Kreme had a few Christmas doughnuts. It is the first time I have had a good reason to buy a doughnut from Krispy Kreme. 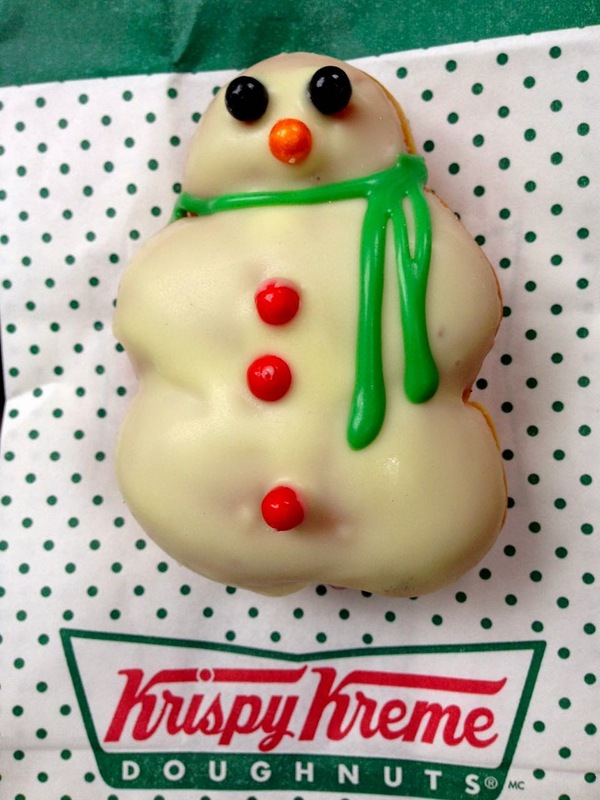 We shared this cute snowman doughnut, covered in white chocolate and filled with lots of sticky jam. We wandered along to Myer through the Block Arcade and Royal Arcade which are always festively festooned! 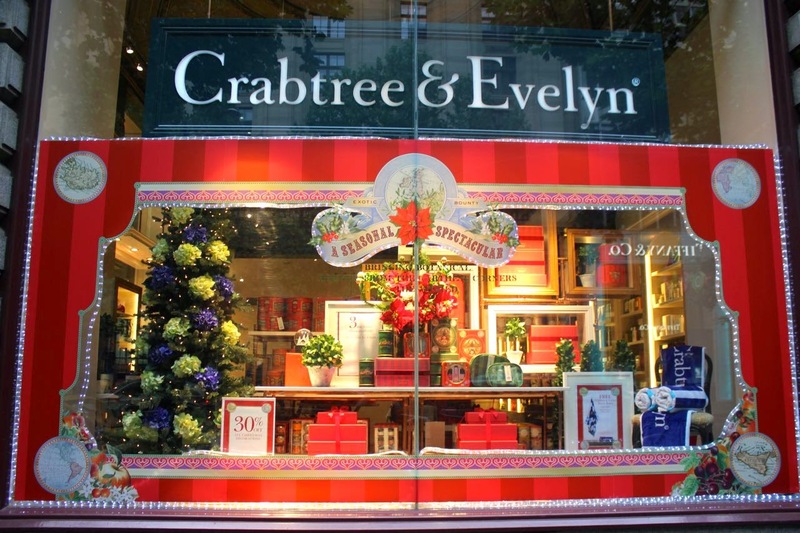 Here is Crabtree and Evelyn's window display at the entrance to the Block Arcade. Inside we were very tempted by all the marvellous Christmas chocolates at Haig's. 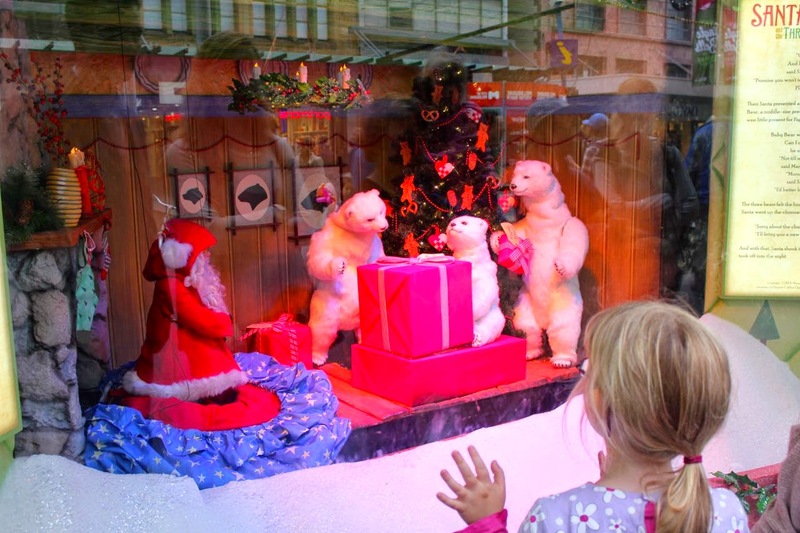 Myer Christmas windows is a Melbourne tradition. I have been going to see them ever since I can remember. 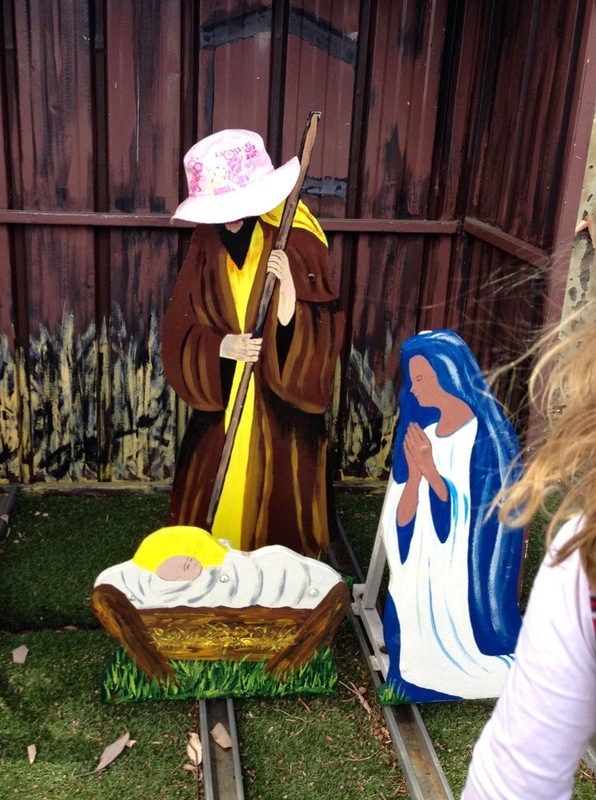 Each year they have displays with moving parts that tells a story. (This year was Santa Claus and the Three Bears.) They have become more technically sophisticated but children still find them magical. Then we went to visit Santa at Myer. It was late and there were no queues. At Sylvia's school it has been busy with end of school year activities - instrumental concert, diorama displays, end of year parties, catch up ukelele lessons, anticipation about whose class she will be in next year. 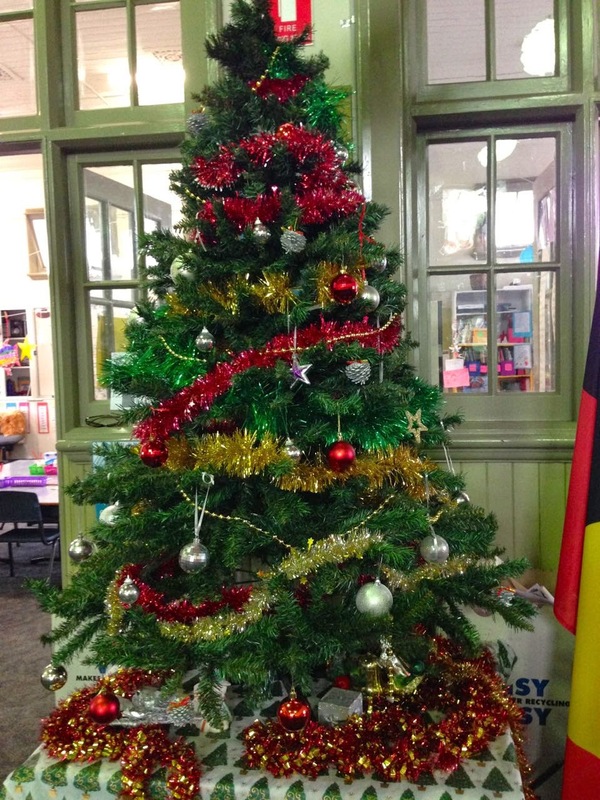 I really like the Christmas tree outside her classroom. 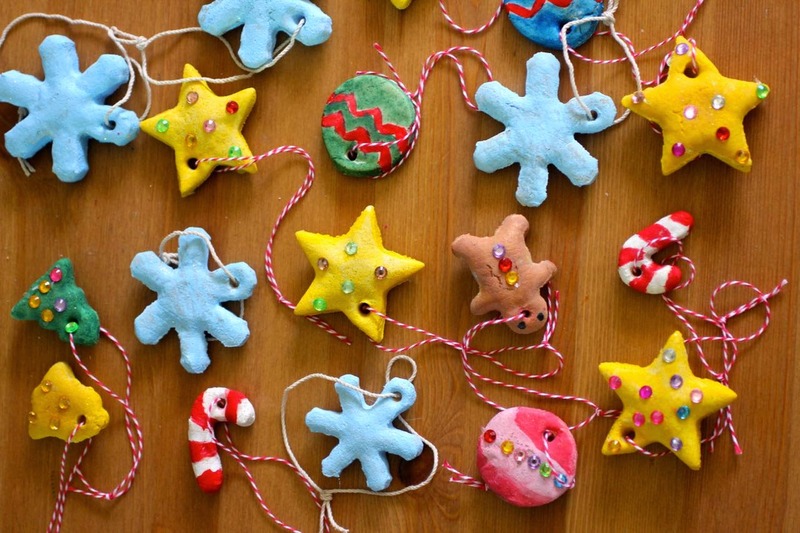 A few weeks back we made salt dough tree decorations. Sylvia decided to give some to friends, teachers and cousins. You can see the finished decorations at the top of the post. And yes there are some snowflakes a la Frozen. 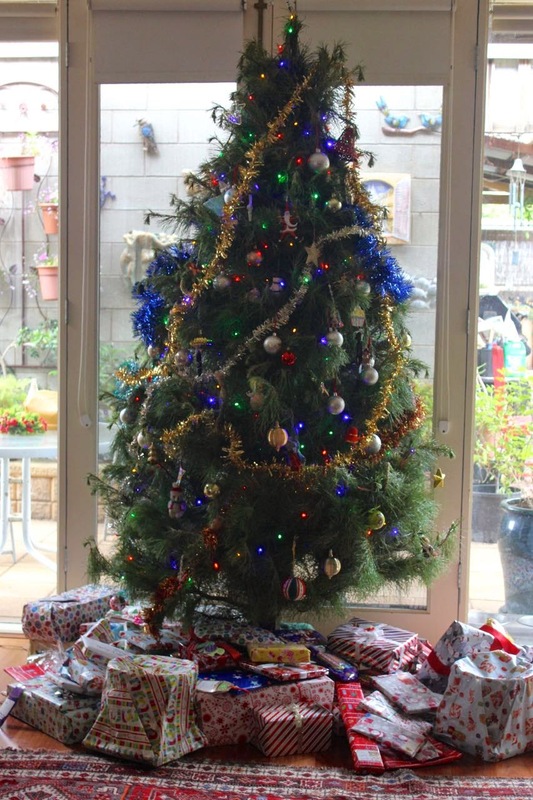 And here is our Christmas tree that we decorated on the weekend. Sylvia is delighted with it. You can't see individual decorations in this photo but I can assume you there is a Frozen salt dough snowflake there.